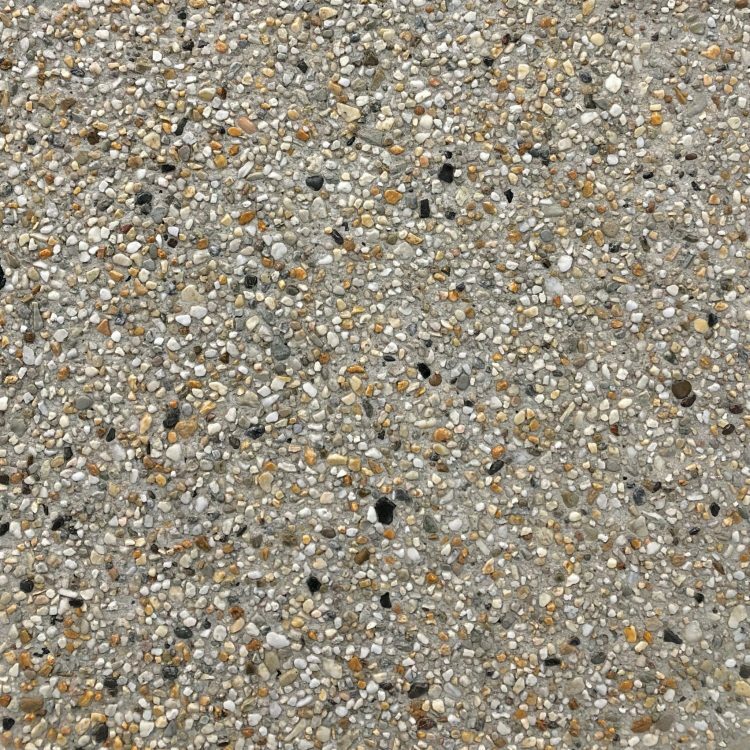 At Metro Mix Concrete, not only do we supply Exposed Aggregate concrete to customers of Melbourne, we design and create concrete supporting the flair and imagination of Melbourne’s best architects and designers with an almost limitless range of functional and decorative concrete finishes, colours and effects. 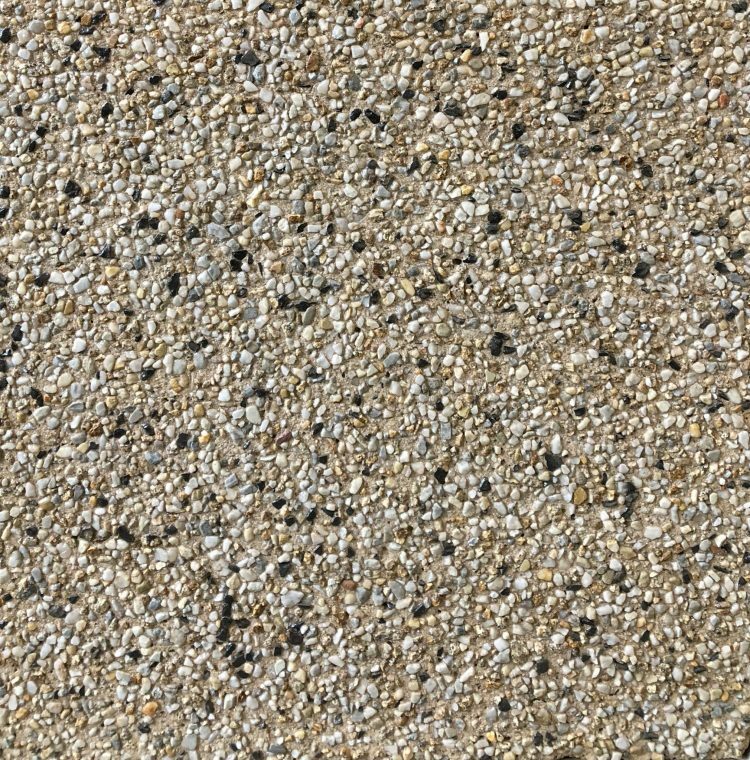 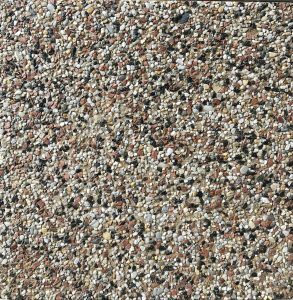 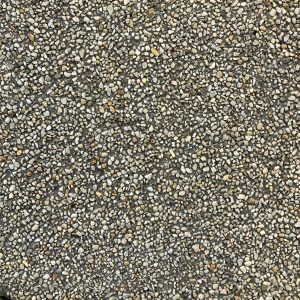 Today’s most common form of decorative concrete is exposed aggregate. 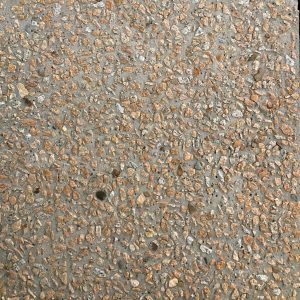 Traditionally, concrete has been finished with a smooth cement surface either trowelled or stippled. 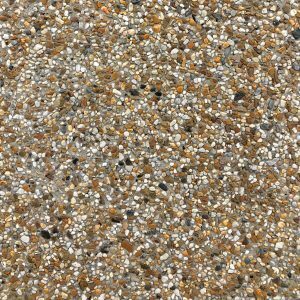 The aggregate – the small stones and pebbles, to which concrete owes its great strength, were to be hidden beneath the surface. 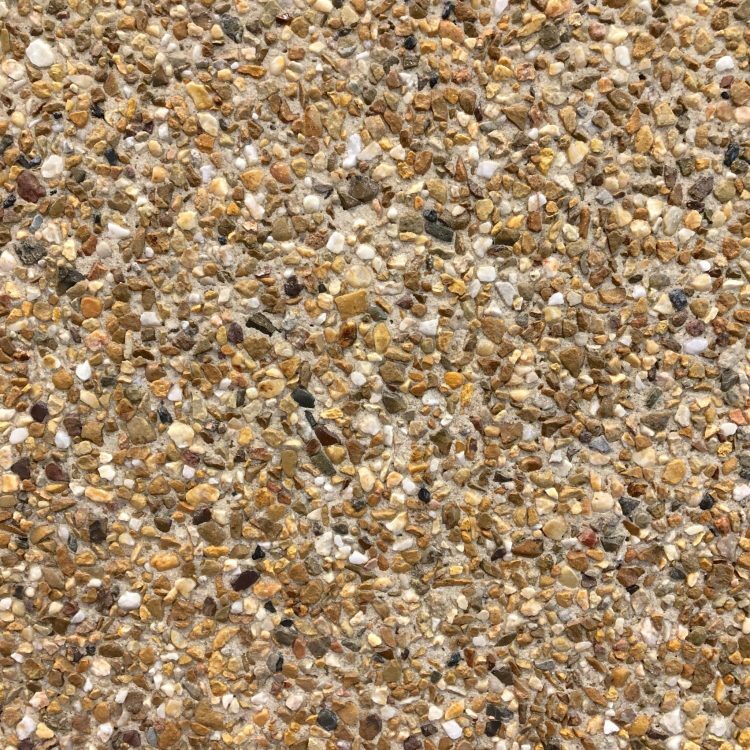 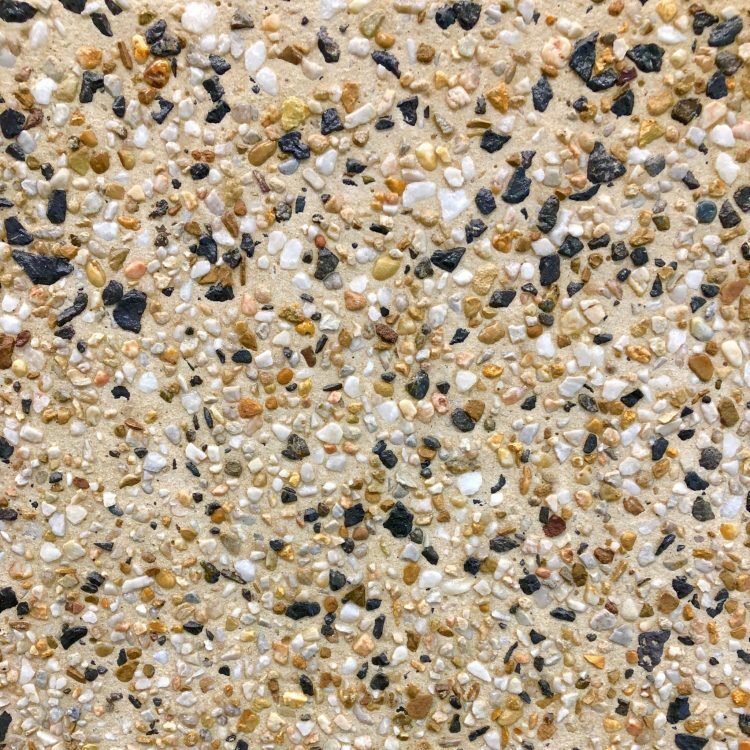 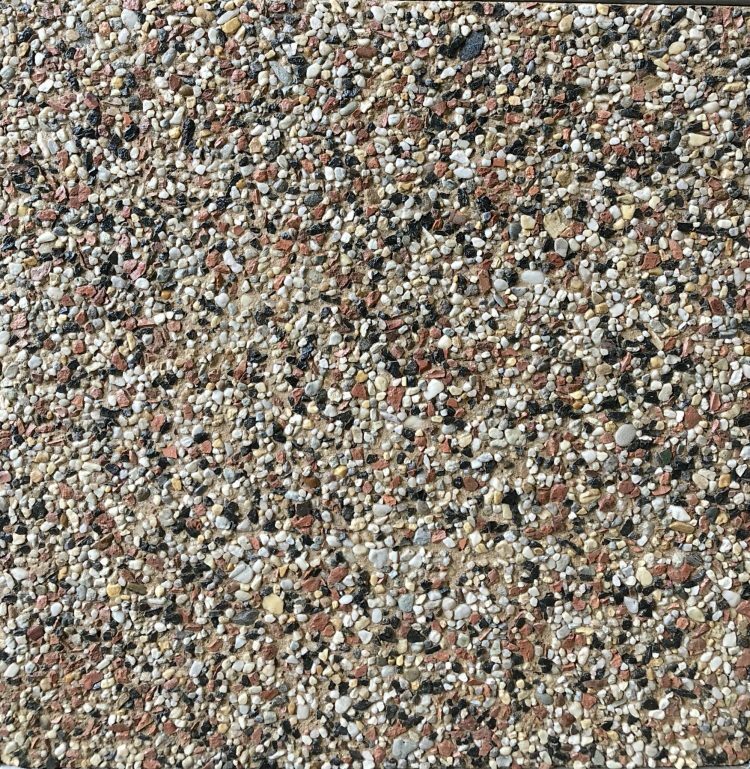 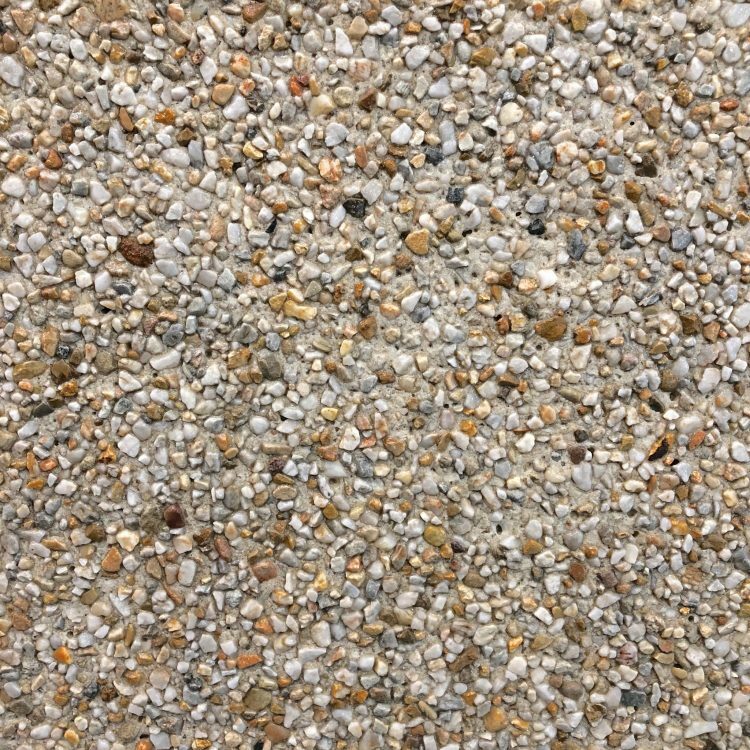 Then one day someone realised that the aggregate inside of concrete could be beautiful and more aesthetically pleasing than the cement that bound it together. 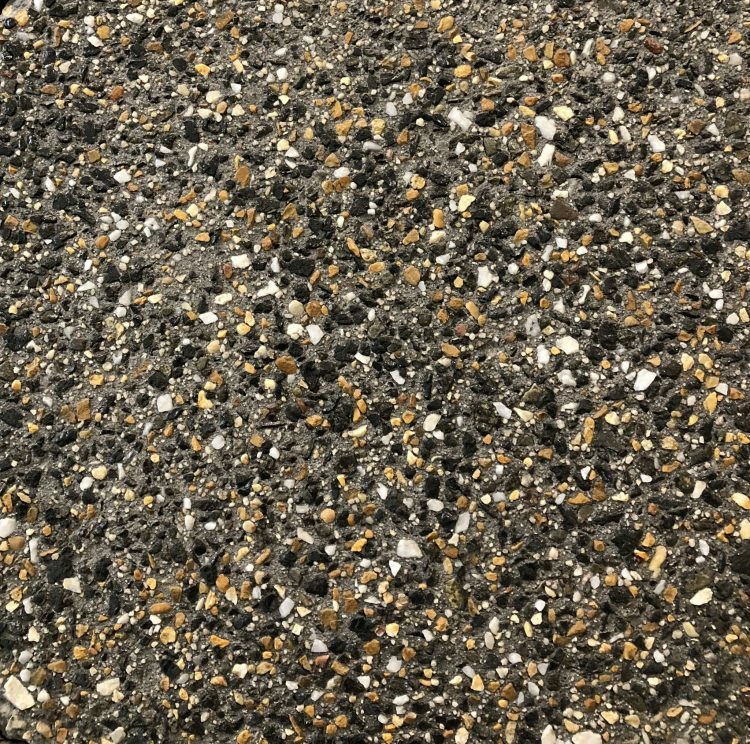 Not only that, but leaving the aggregate exposed provided a highly fricative and durable surface, making it ideal for pools, driveways, motor traffic and for applications where a nonslip pedestrian surface was required. 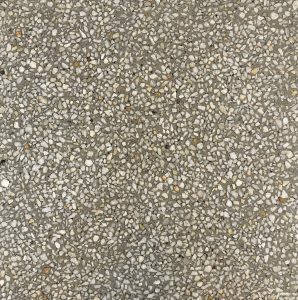 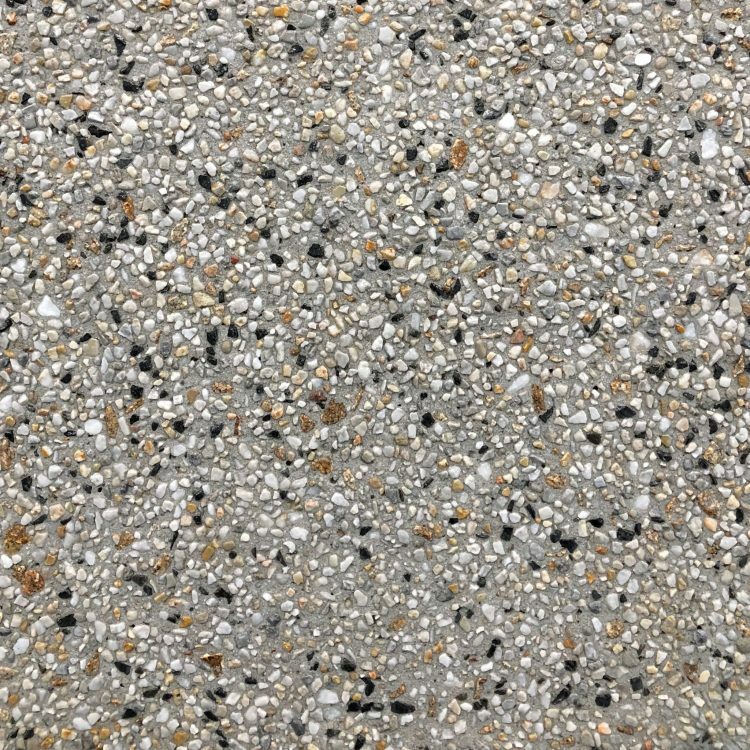 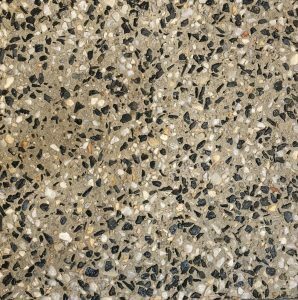 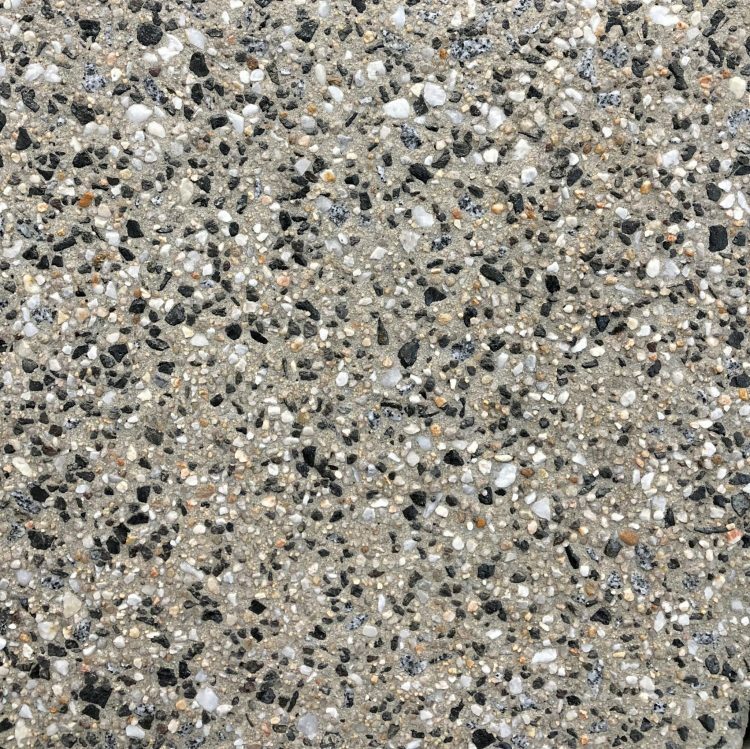 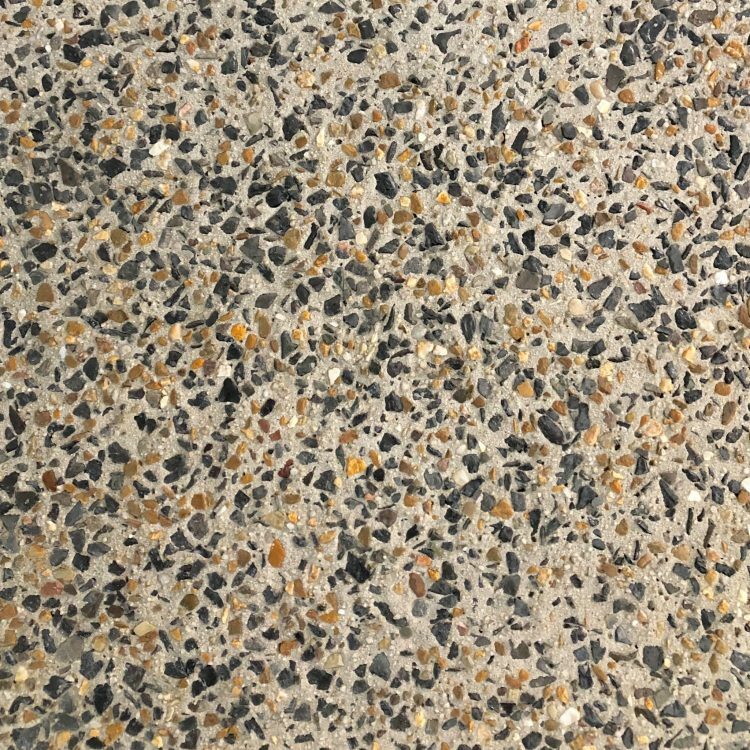 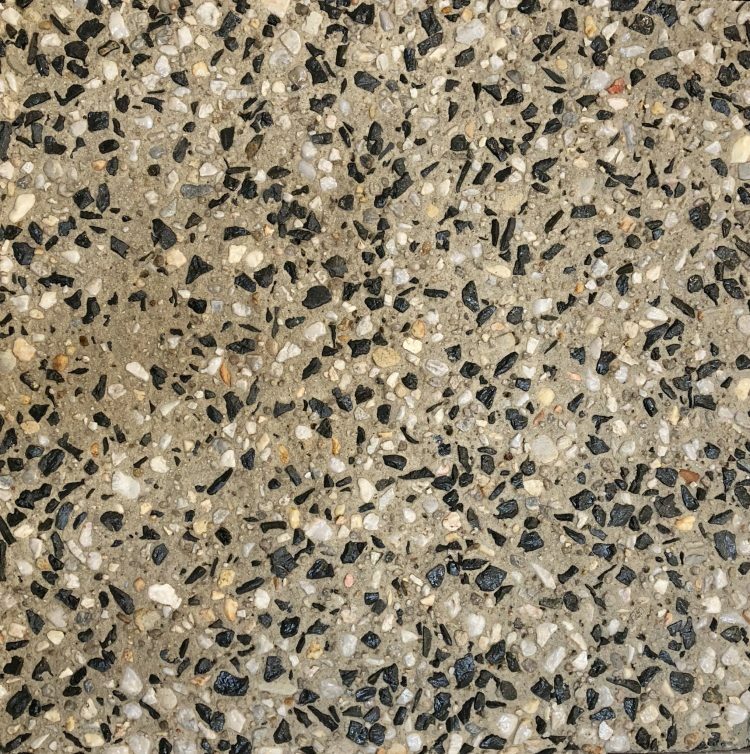 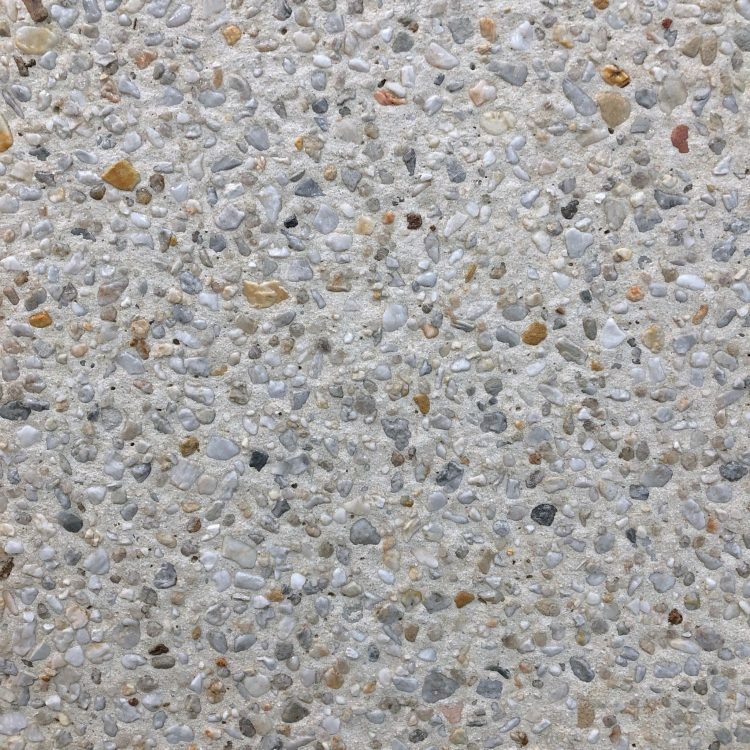 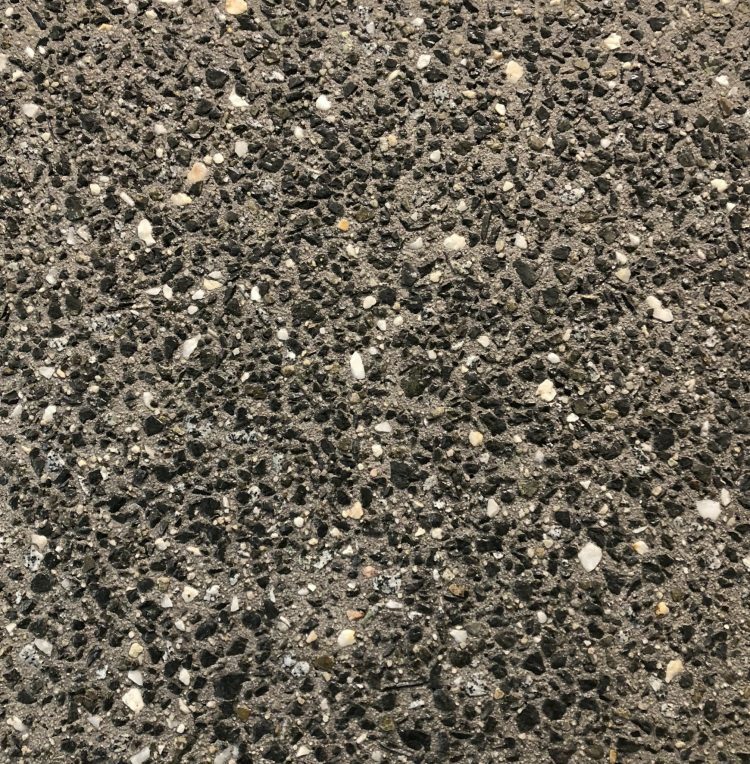 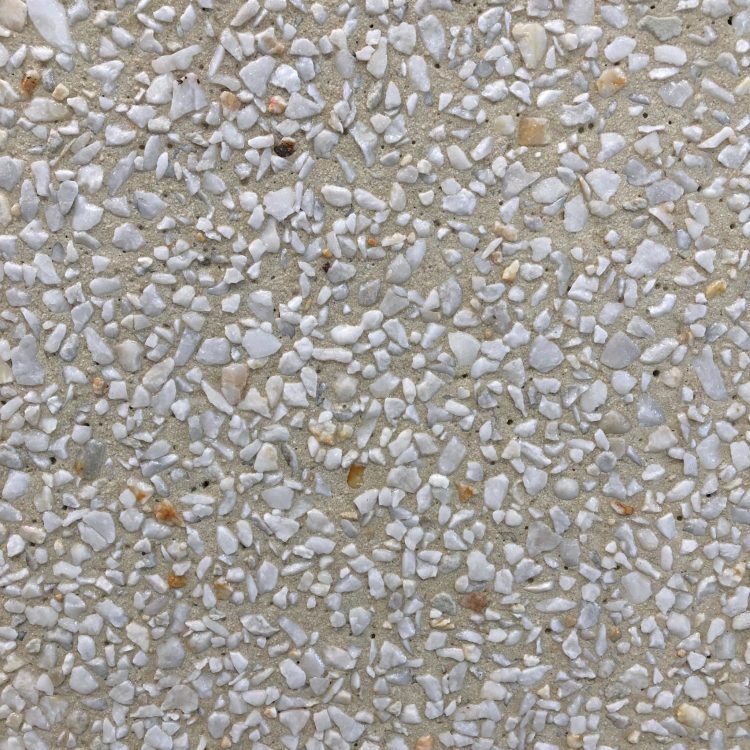 Thus, the exposed aggregate concrete finish was born and no sooner we at Metro Mix Concrete started to work with Melbourne’s architects and designers to diversify and exploit the decorative effects possible with this exciting new finish. 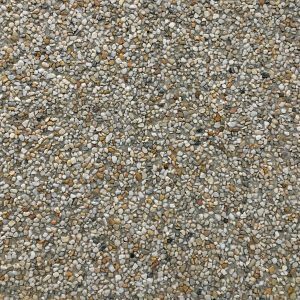 From the start, it was clear that the grade of the aggregate could be varied, both to give different frictional properties and to vary the appearance of the surface. 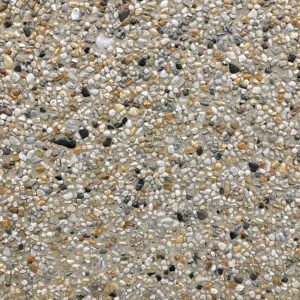 Next, it was realised that different regions produce alluvial gravel and stone of varying textures and colours, suggesting a whole palette of exciting aesthetic effects. 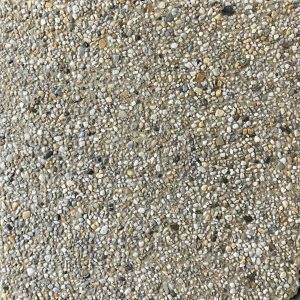 At Metro Mix Concrete, our creators invested extensive research into the sourcing of interesting aggregates that combined the structural properties our customers demanded with exciting innovative and beautiful aesthetic effects. 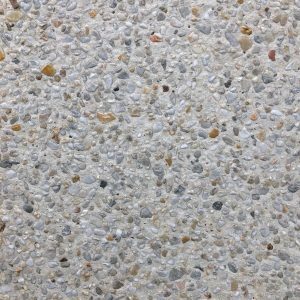 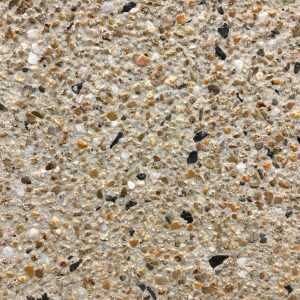 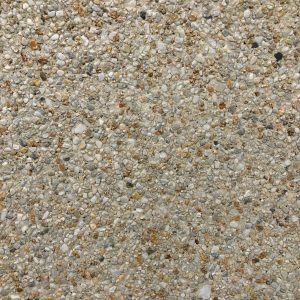 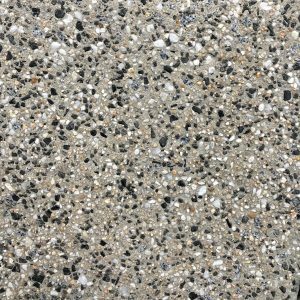 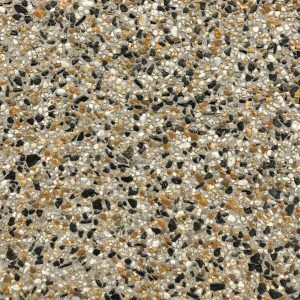 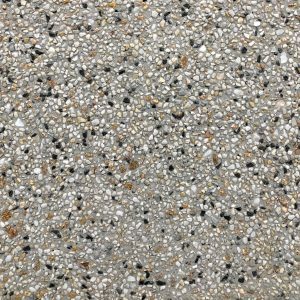 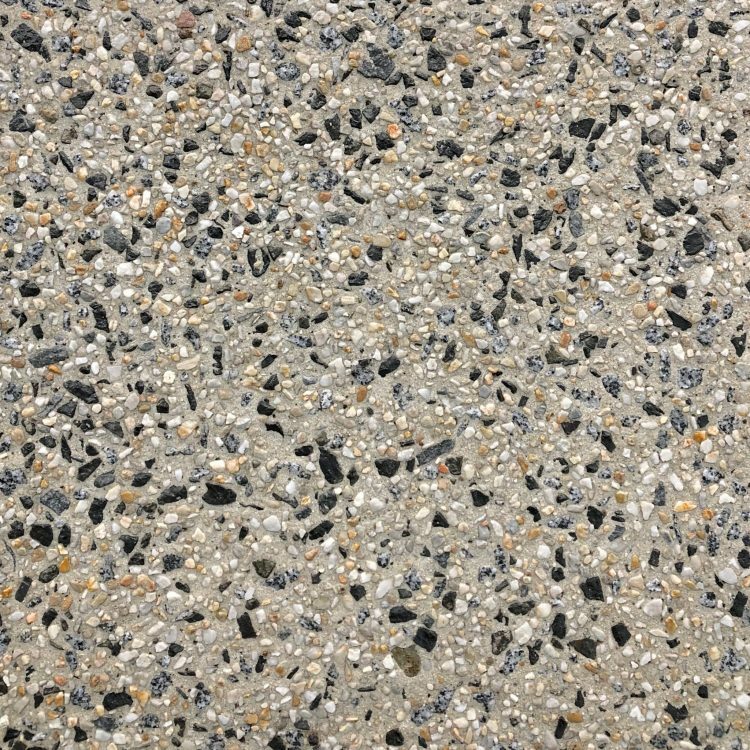 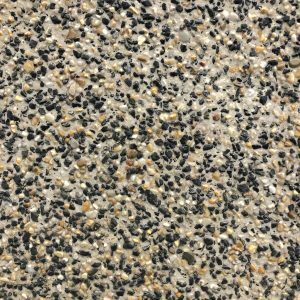 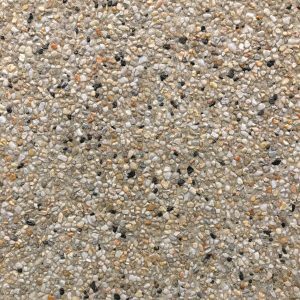 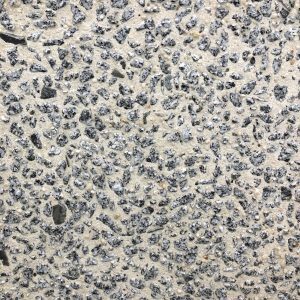 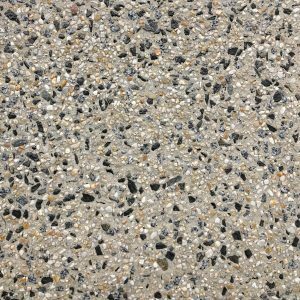 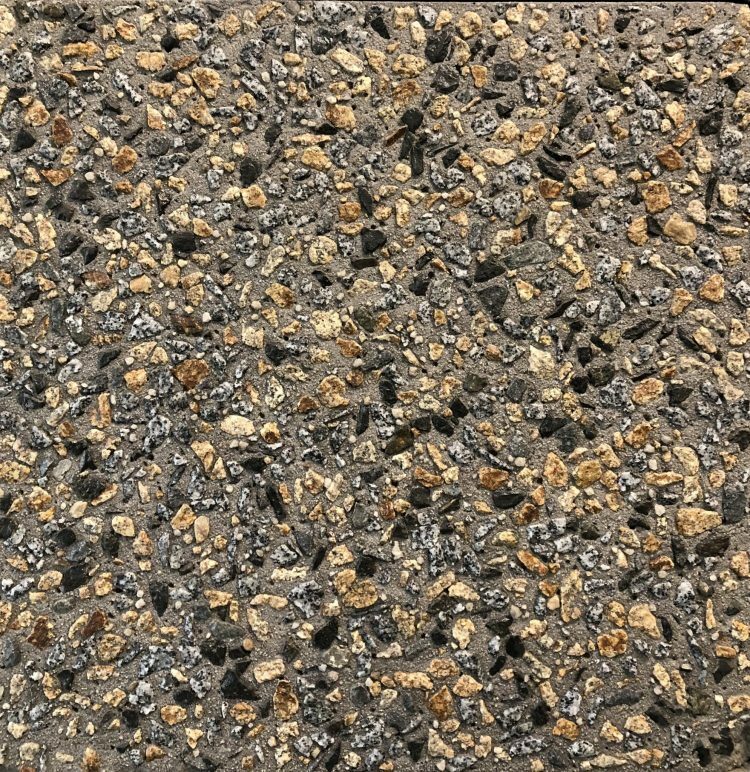 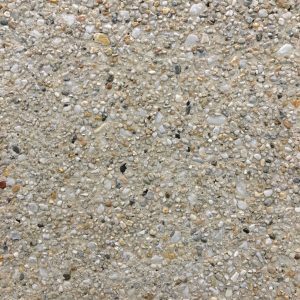 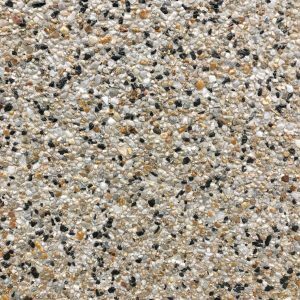 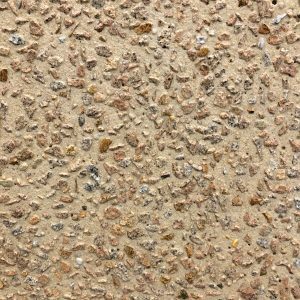 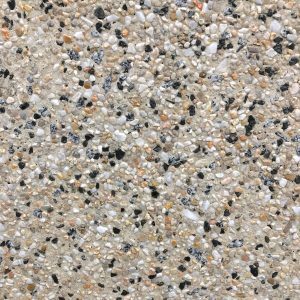 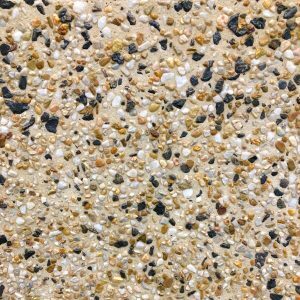 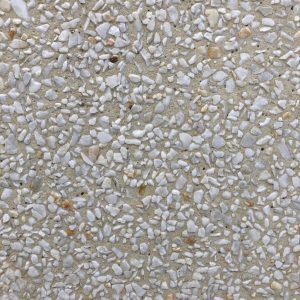 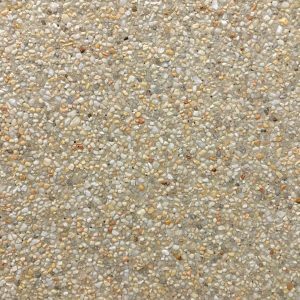 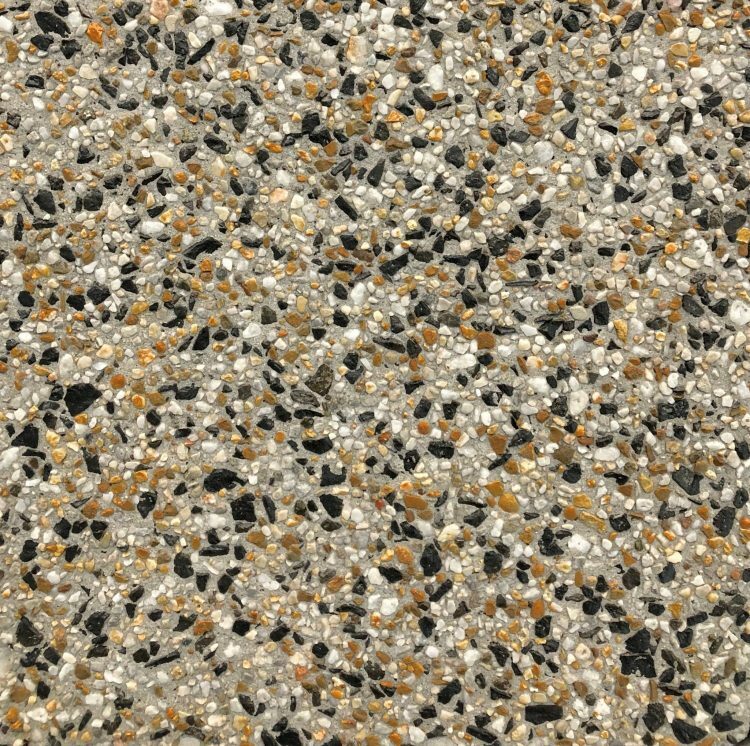 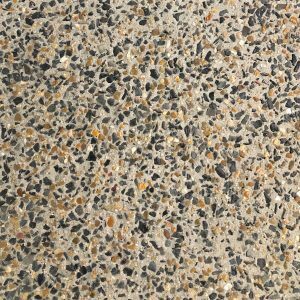 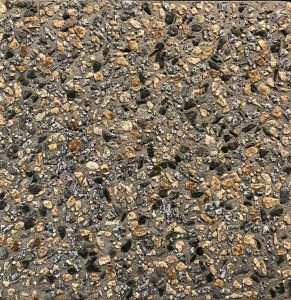 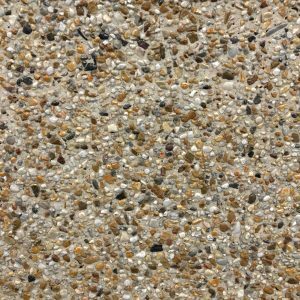 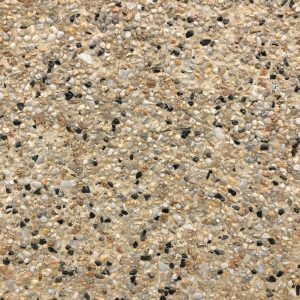 We now offer one of Melbourne’s largest selection of custom concrete finishes which exploit the beauty and functional attributes of exposed aggregate. 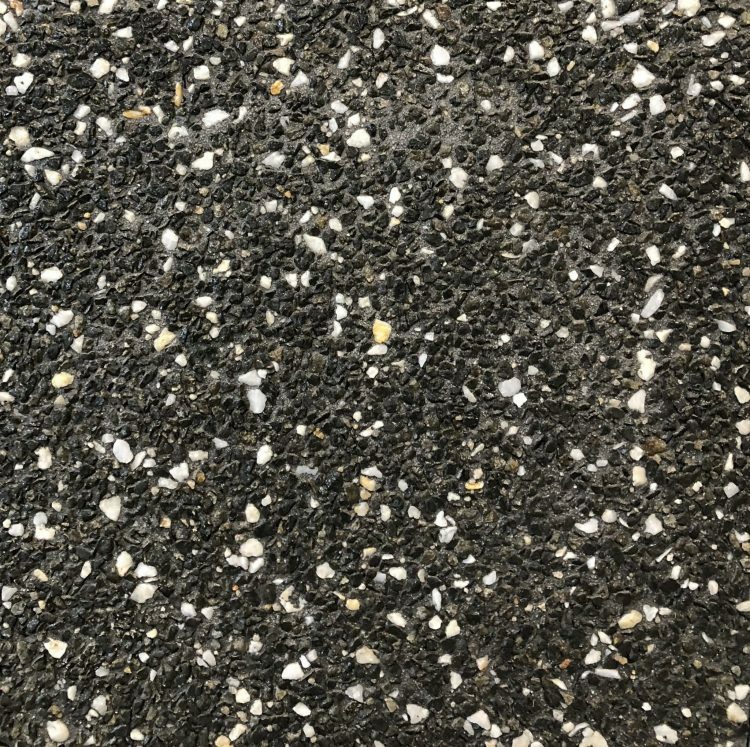 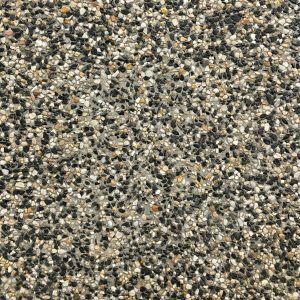 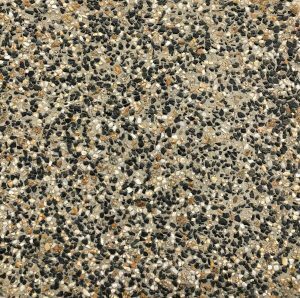 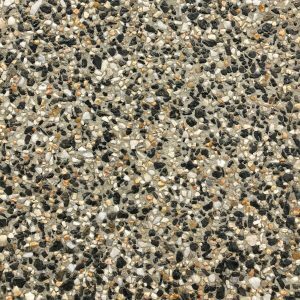 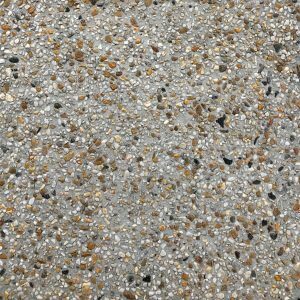 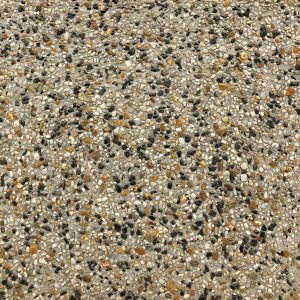 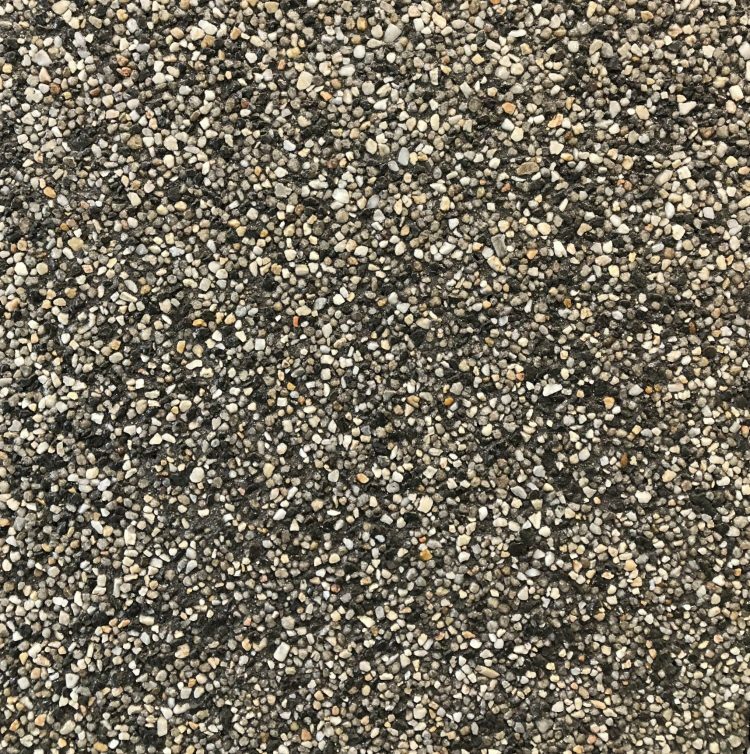 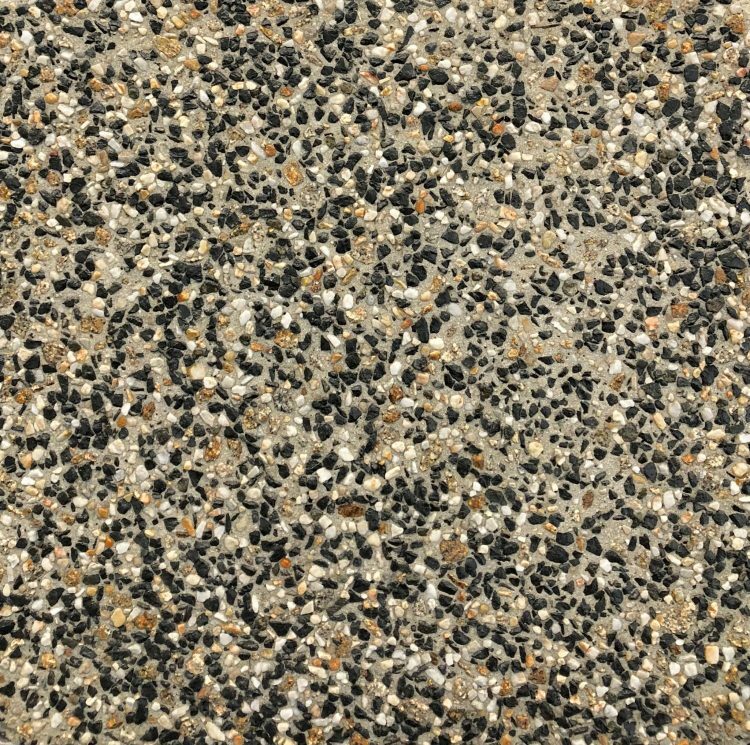 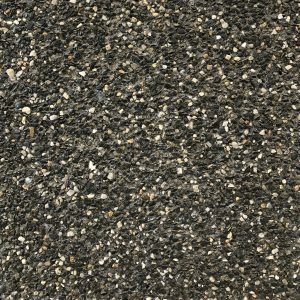 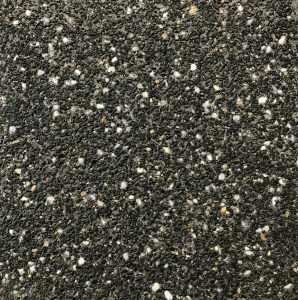 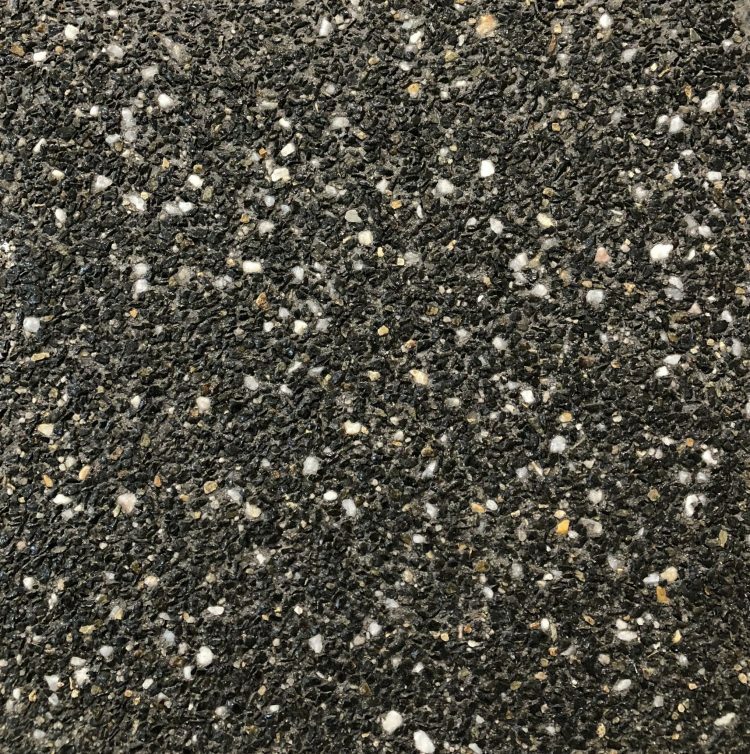 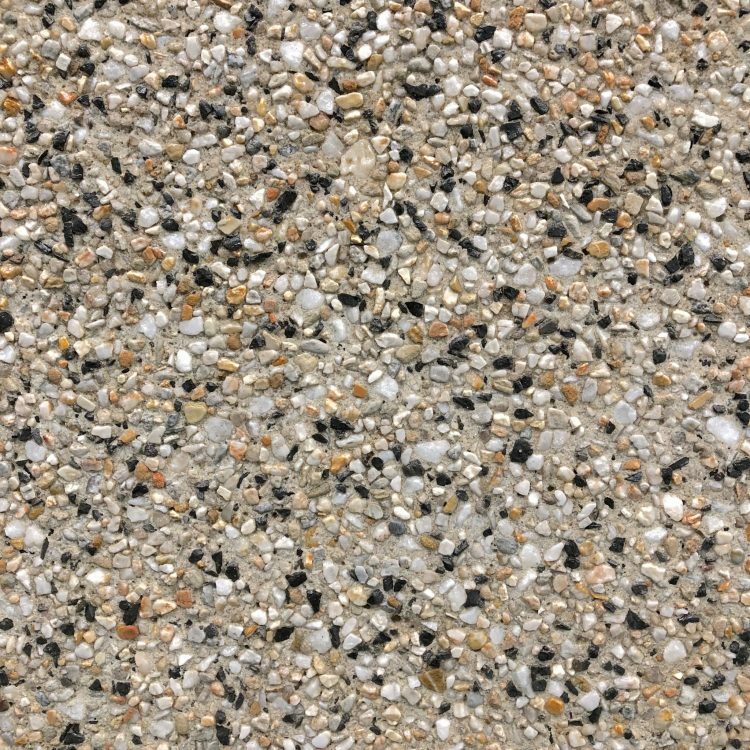 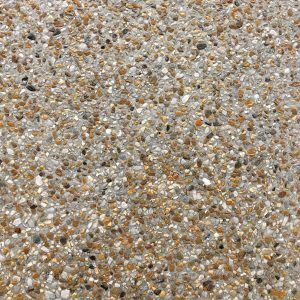 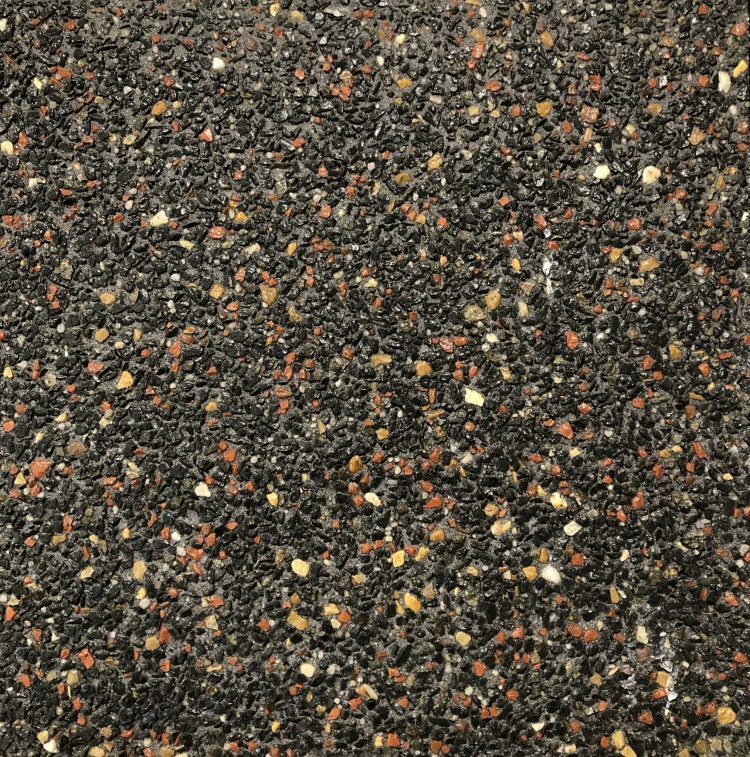 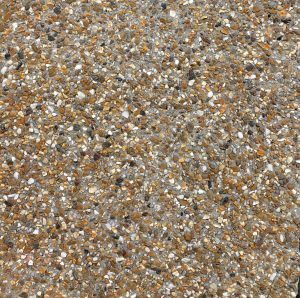 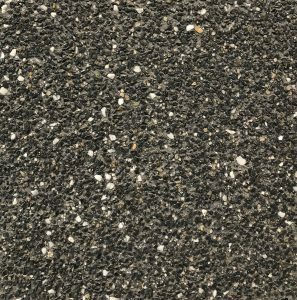 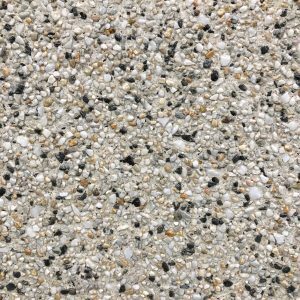 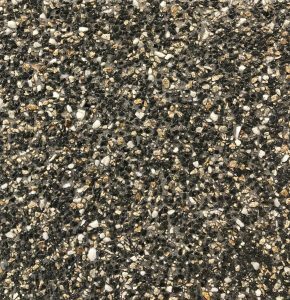 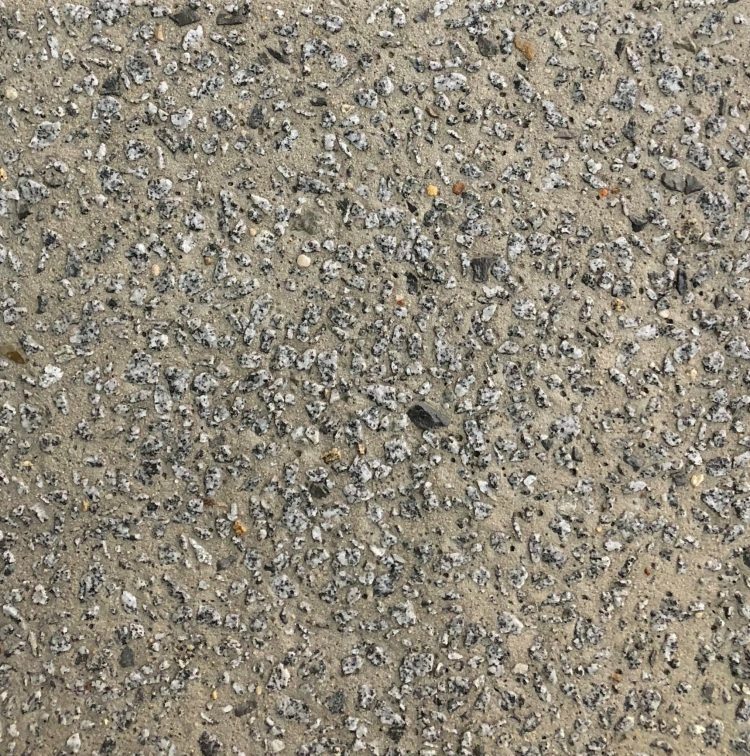 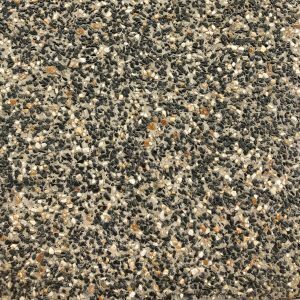 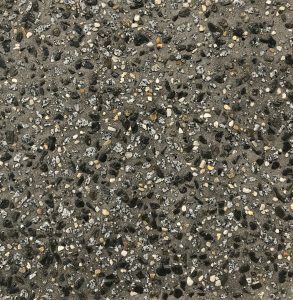 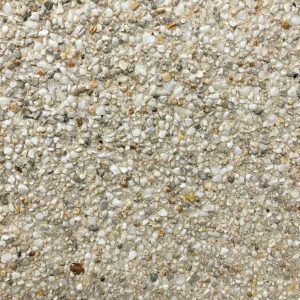 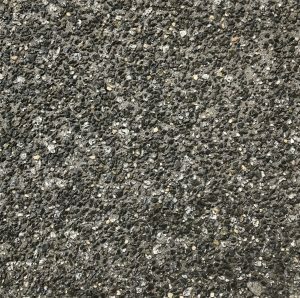 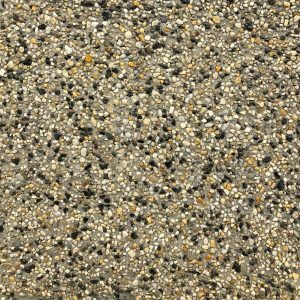 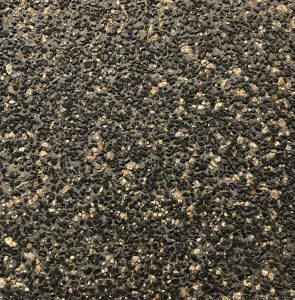 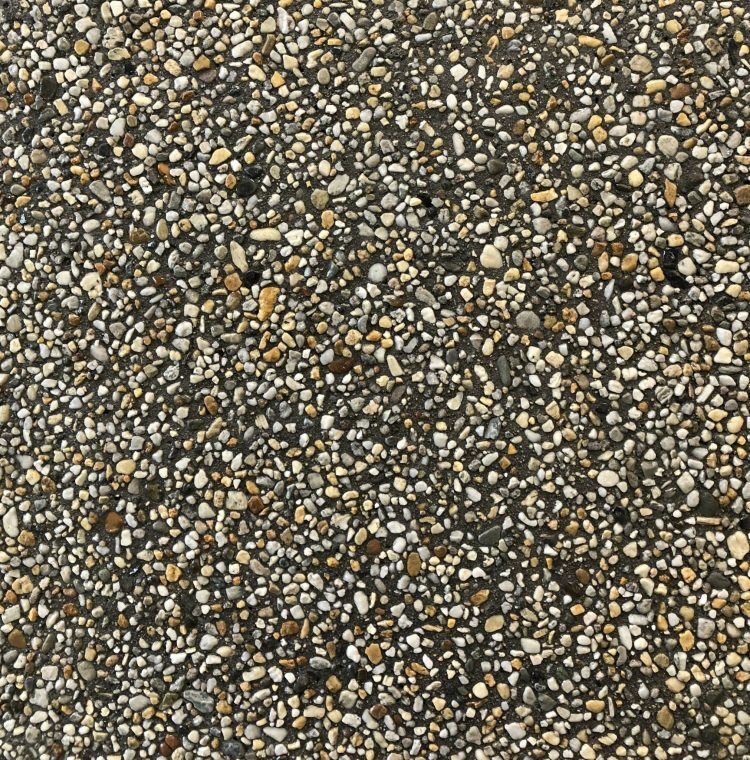 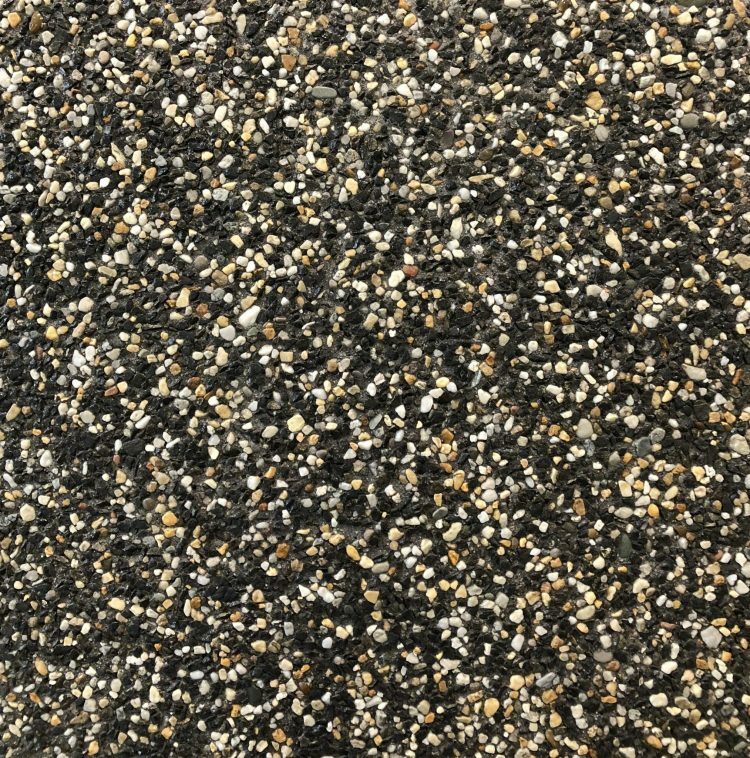 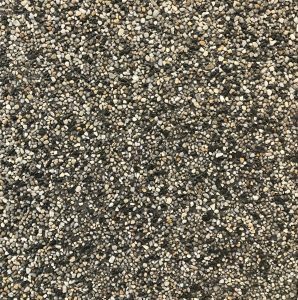 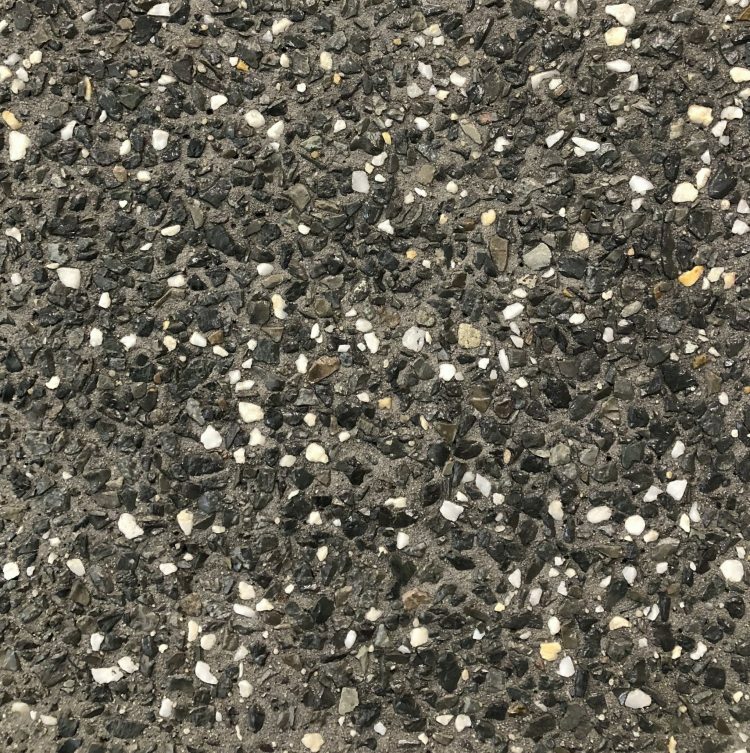 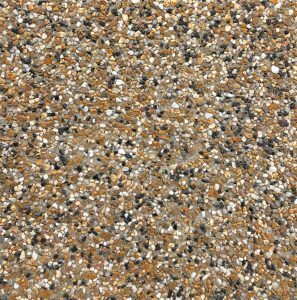 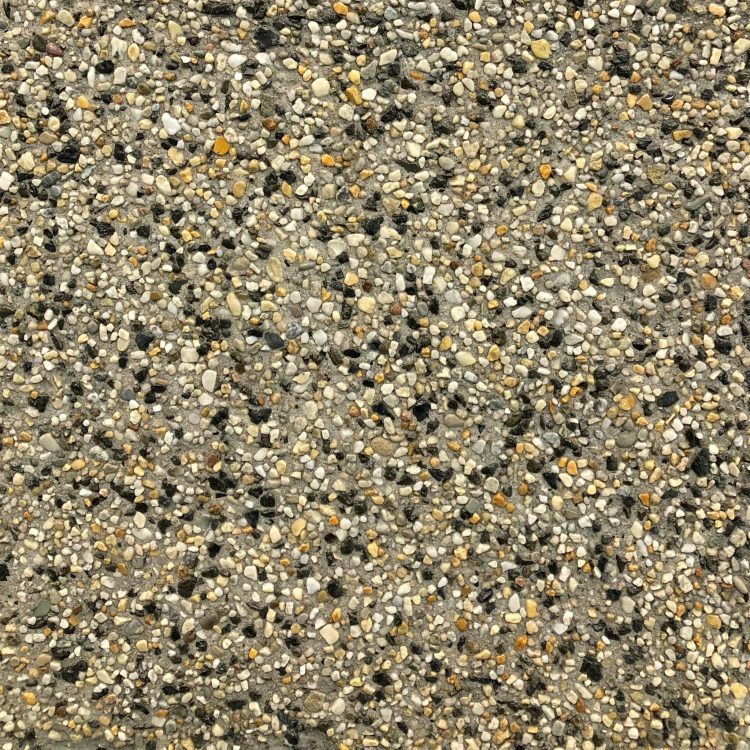 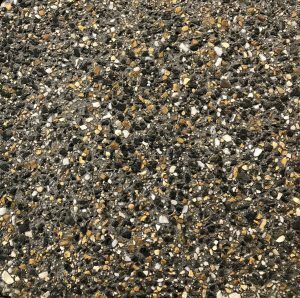 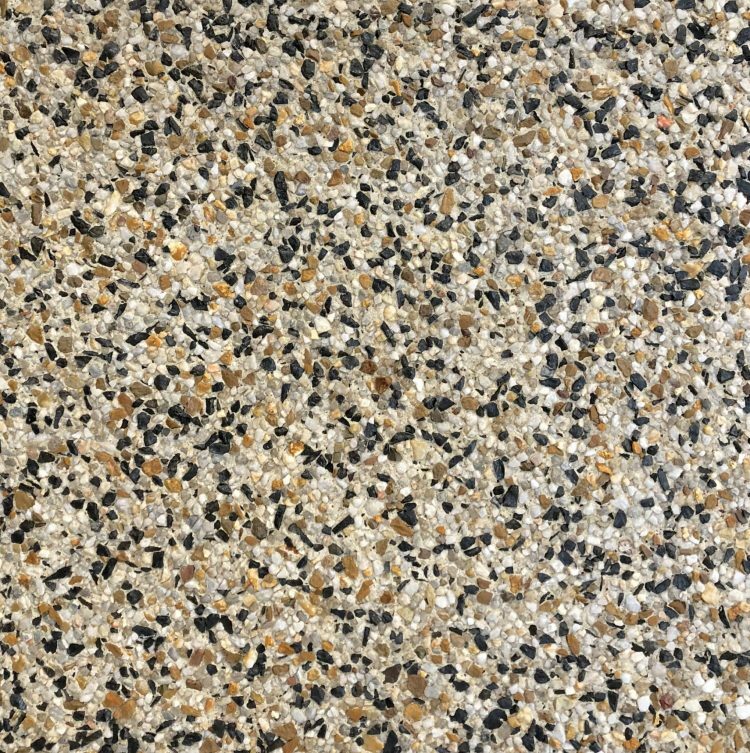 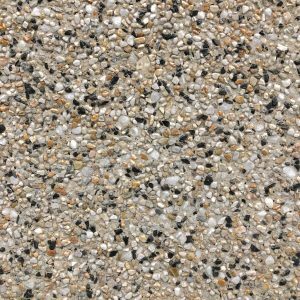 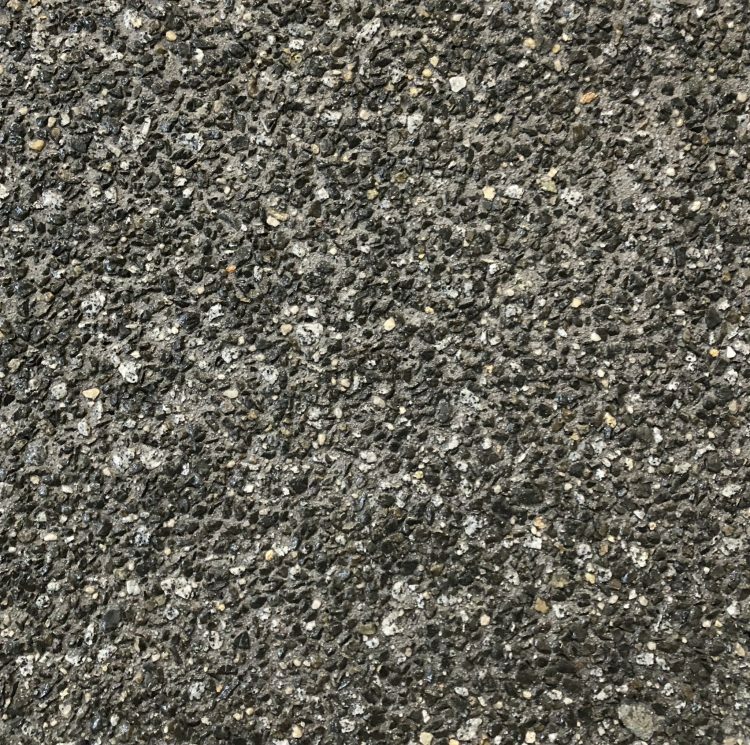 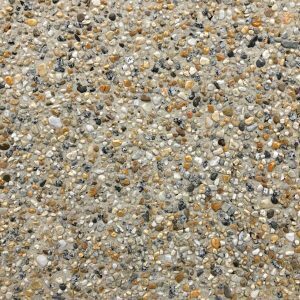 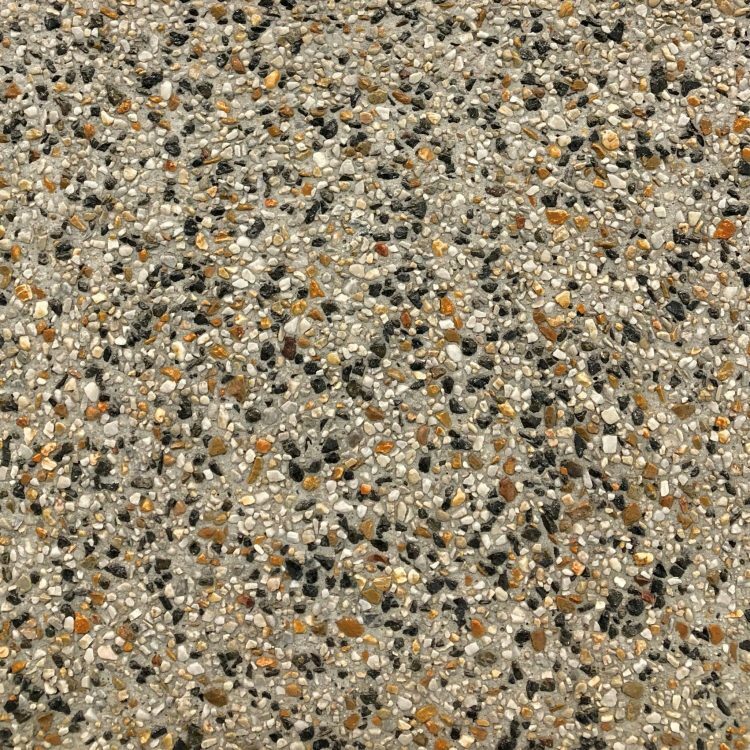 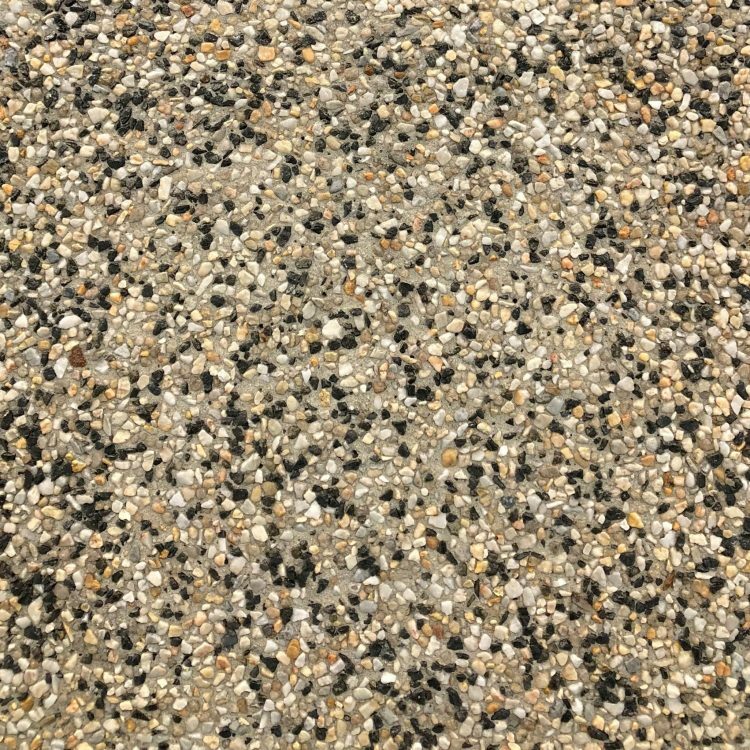 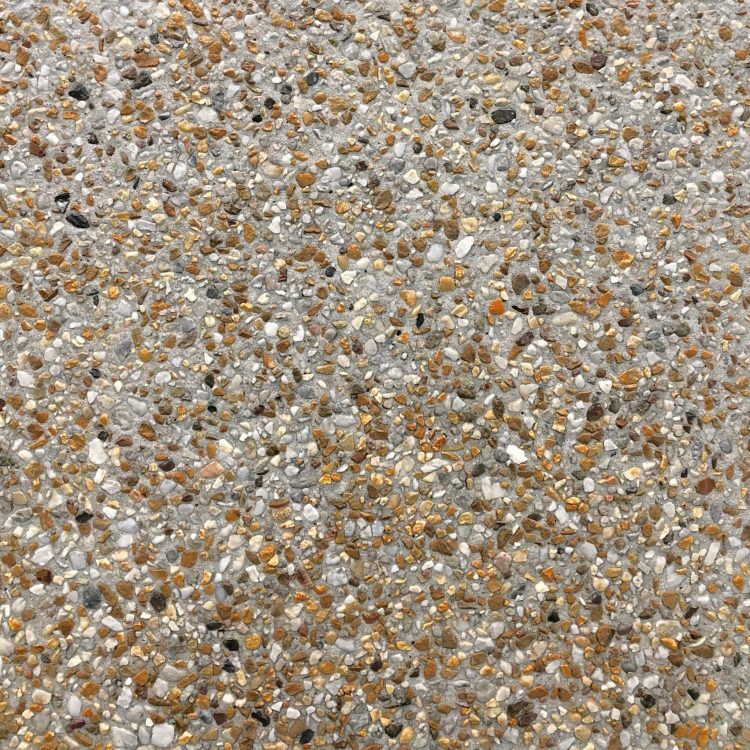 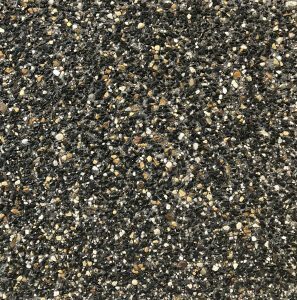 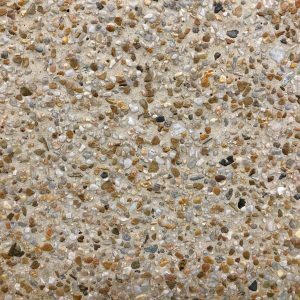 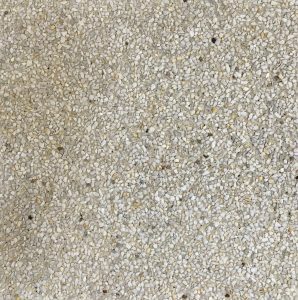 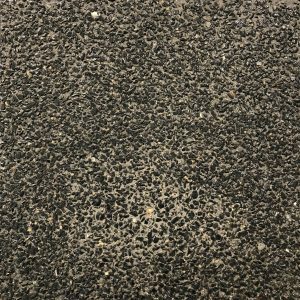 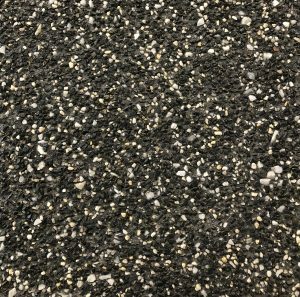 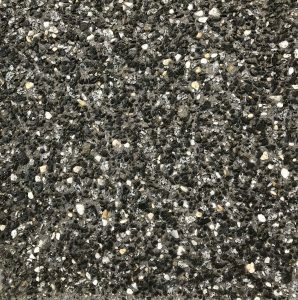 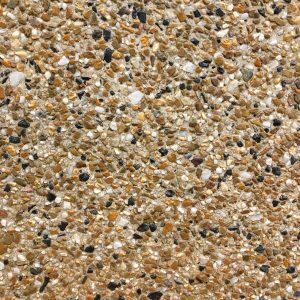 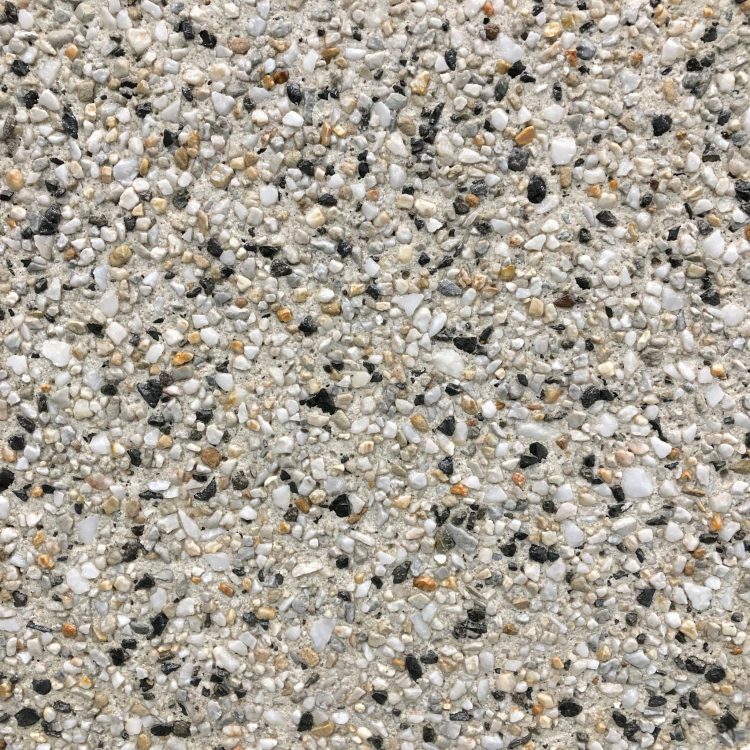 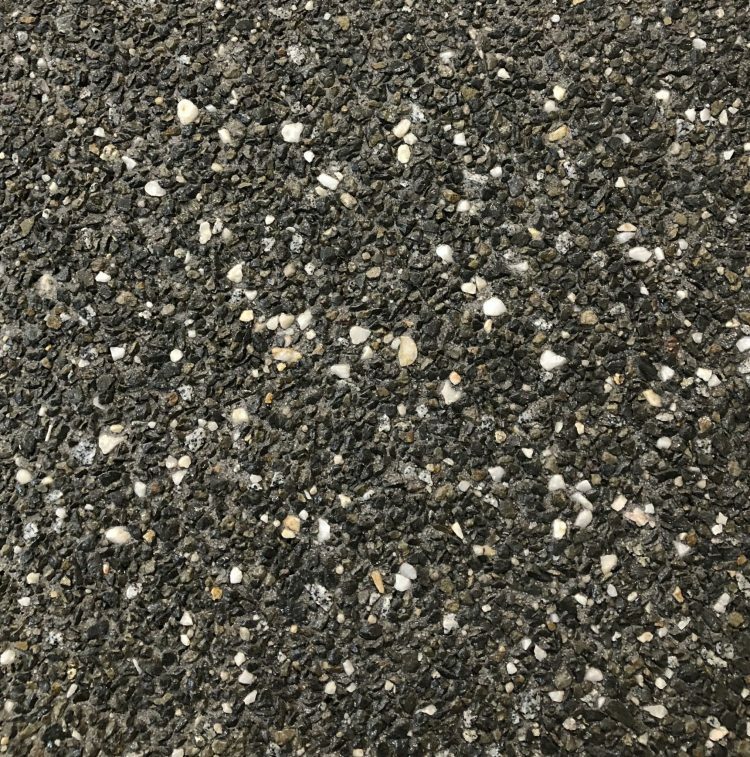 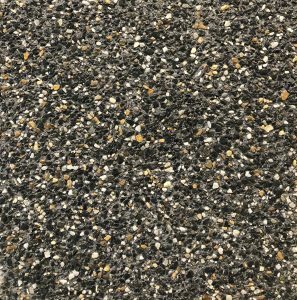 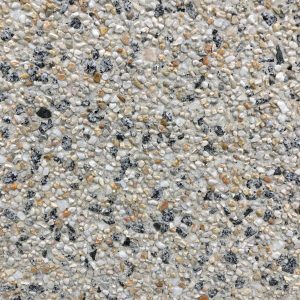 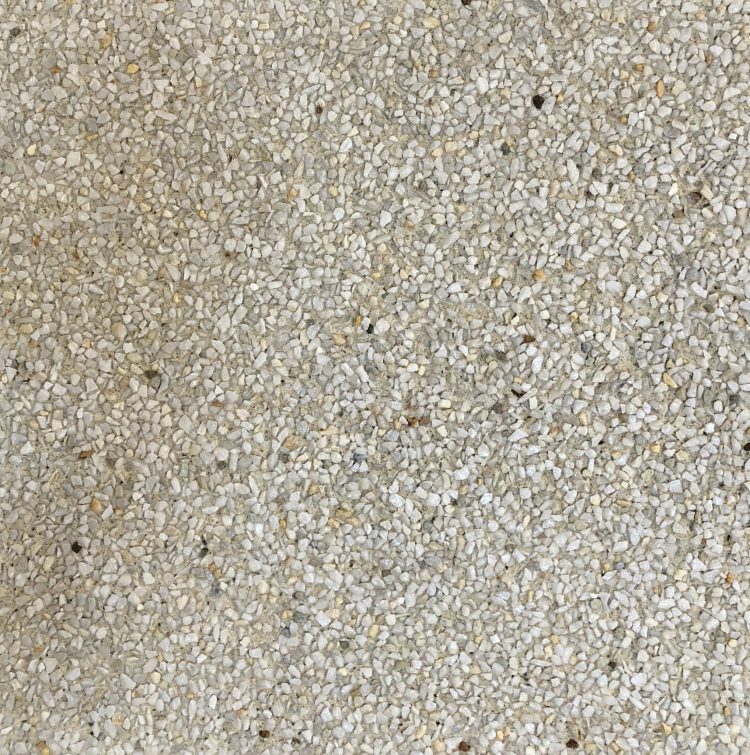 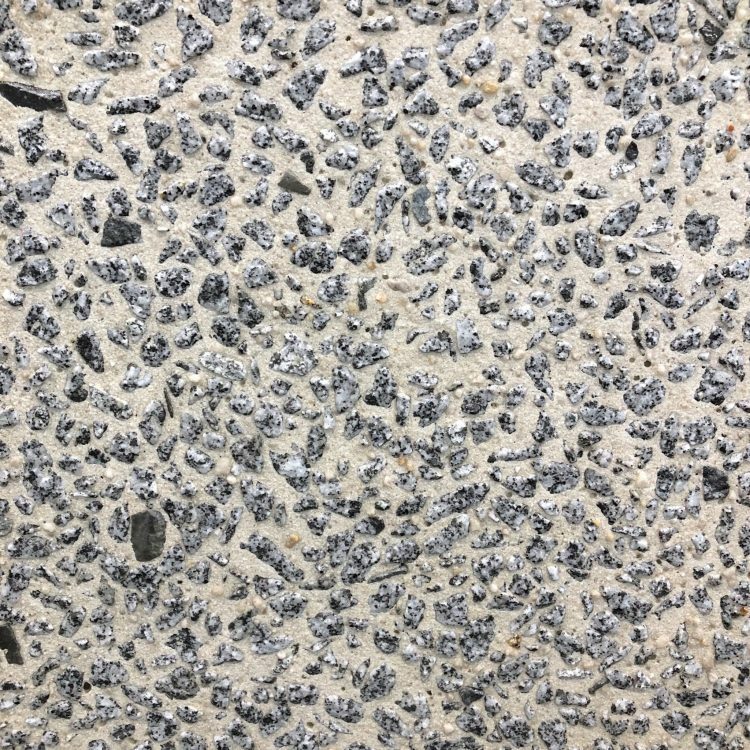 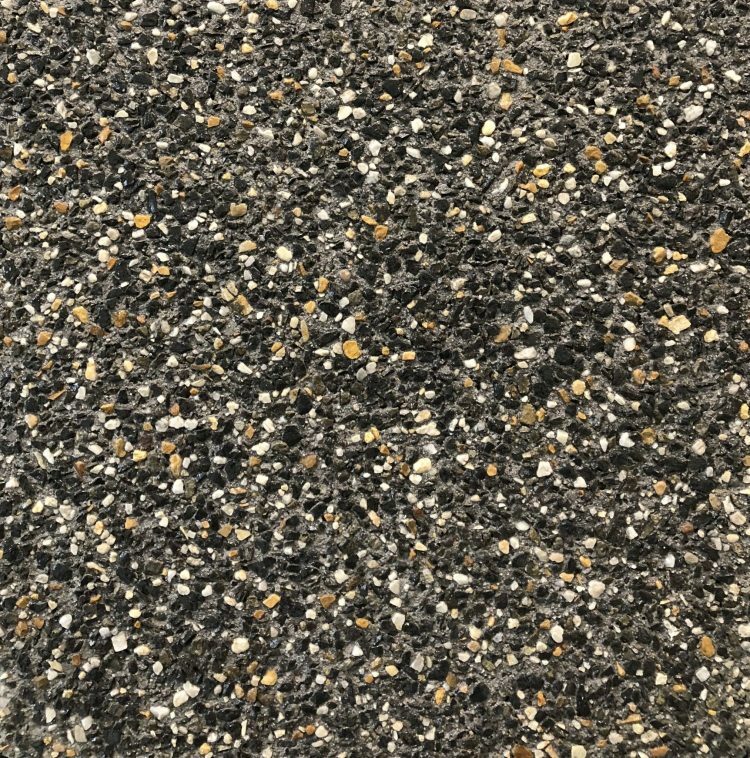 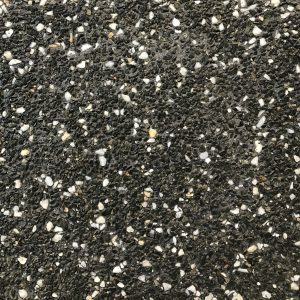 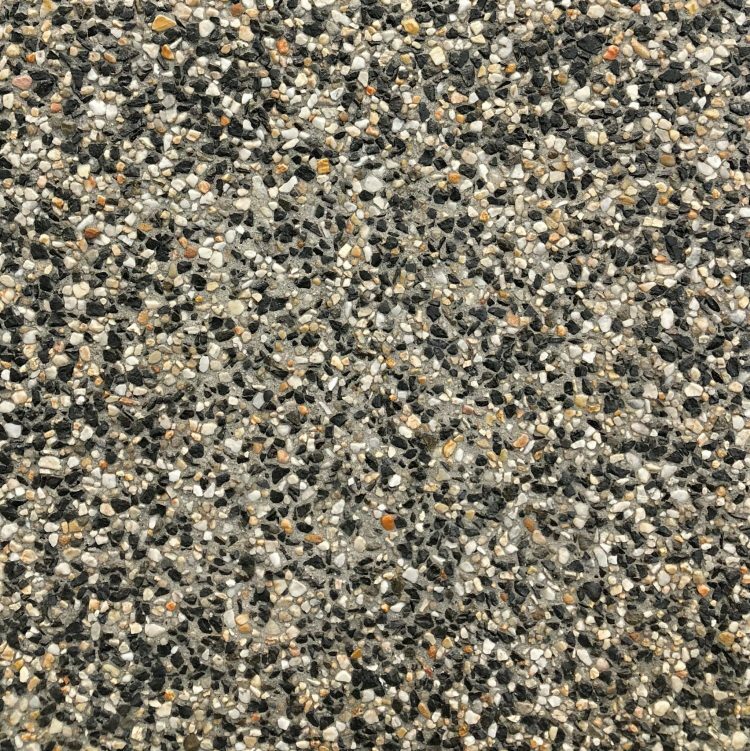 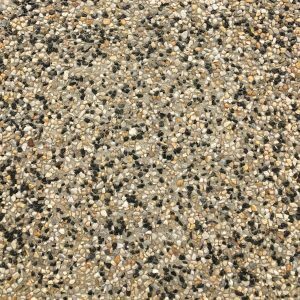 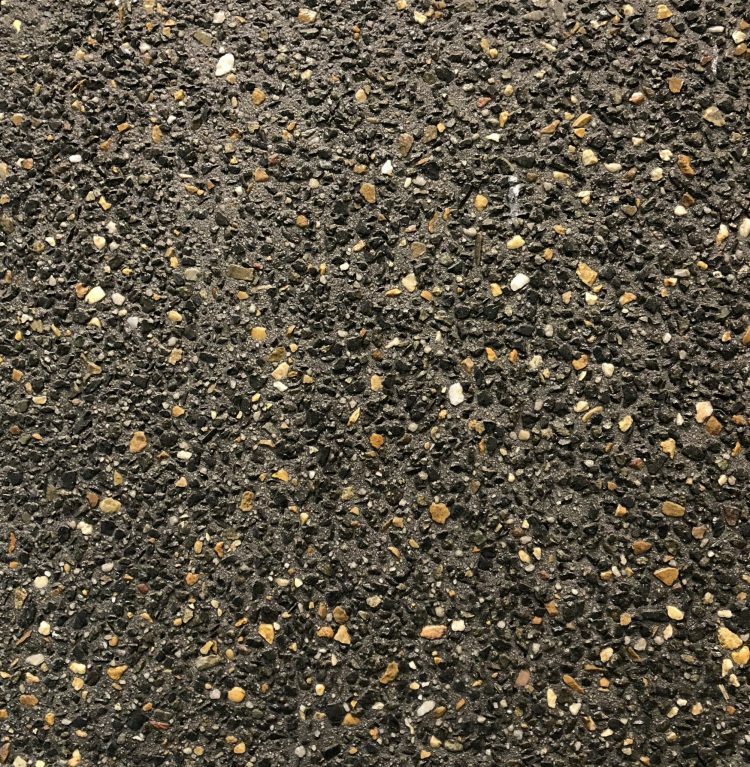 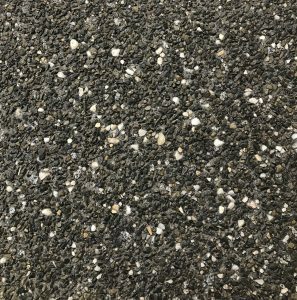 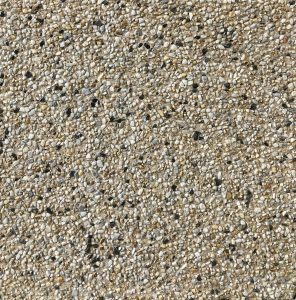 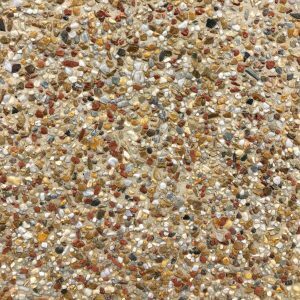 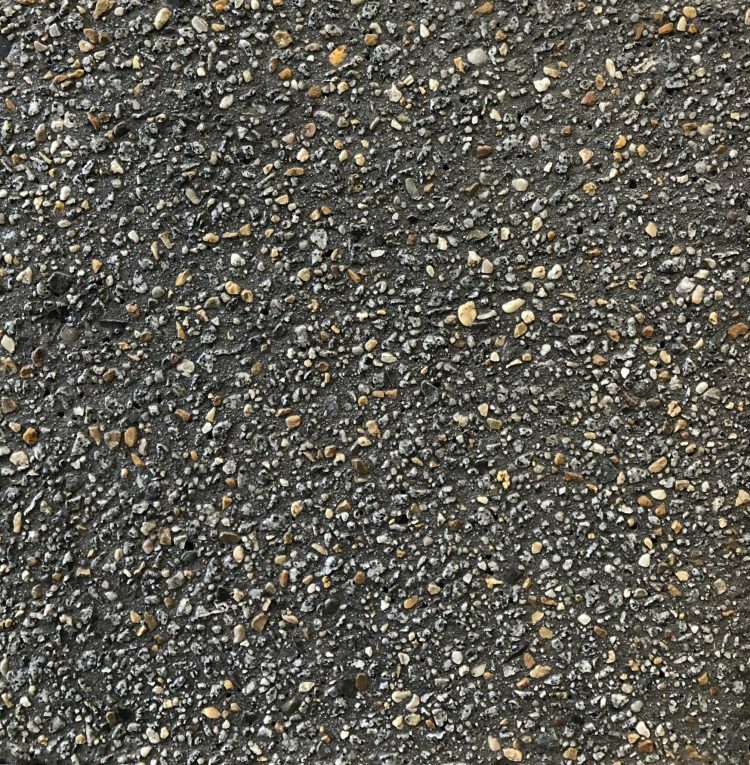 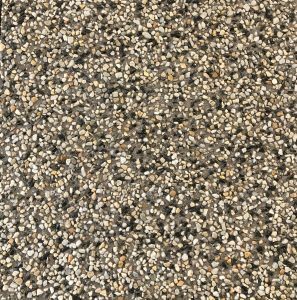 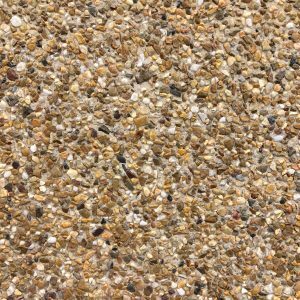 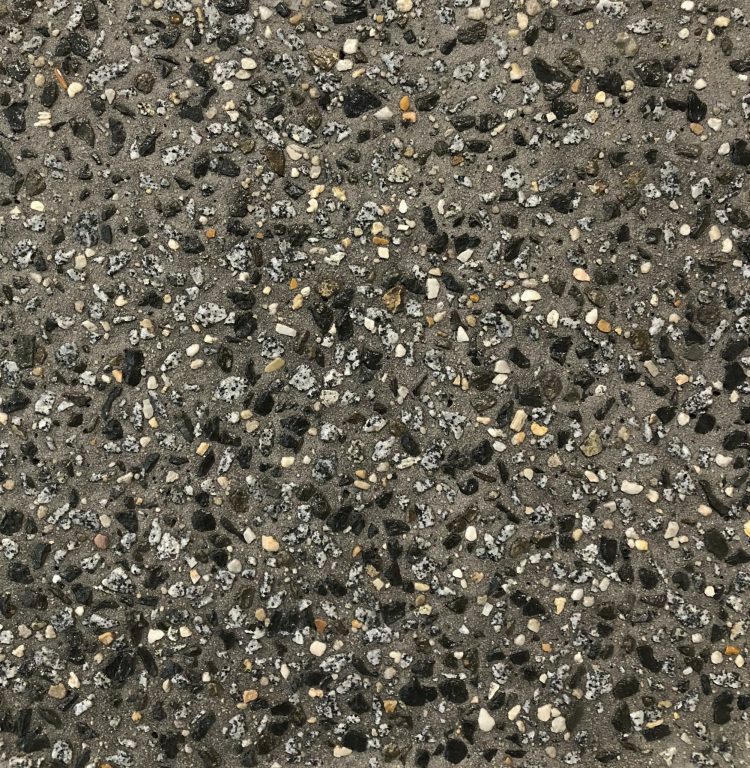 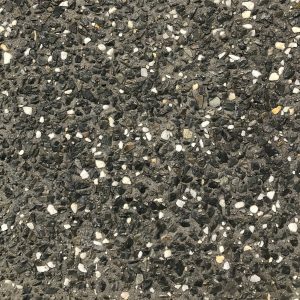 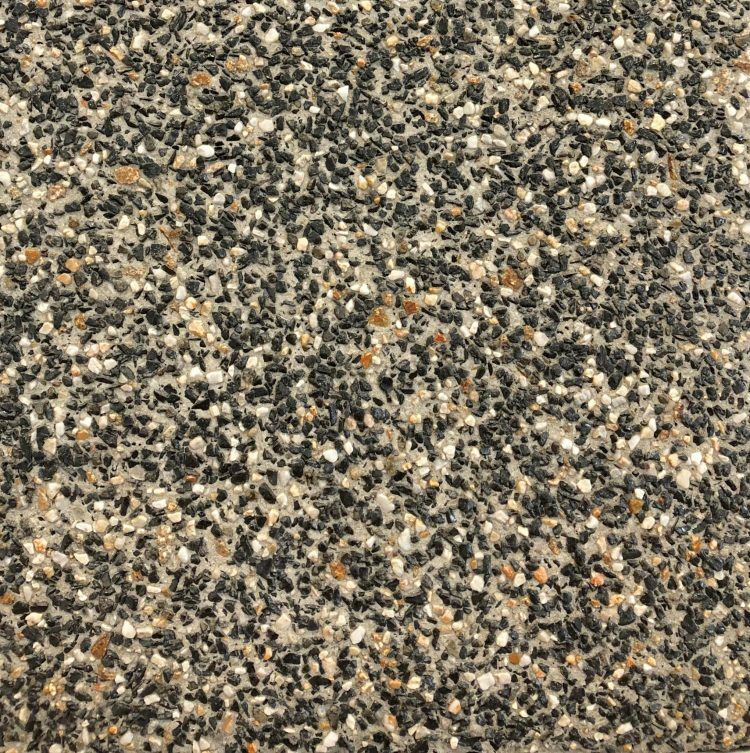 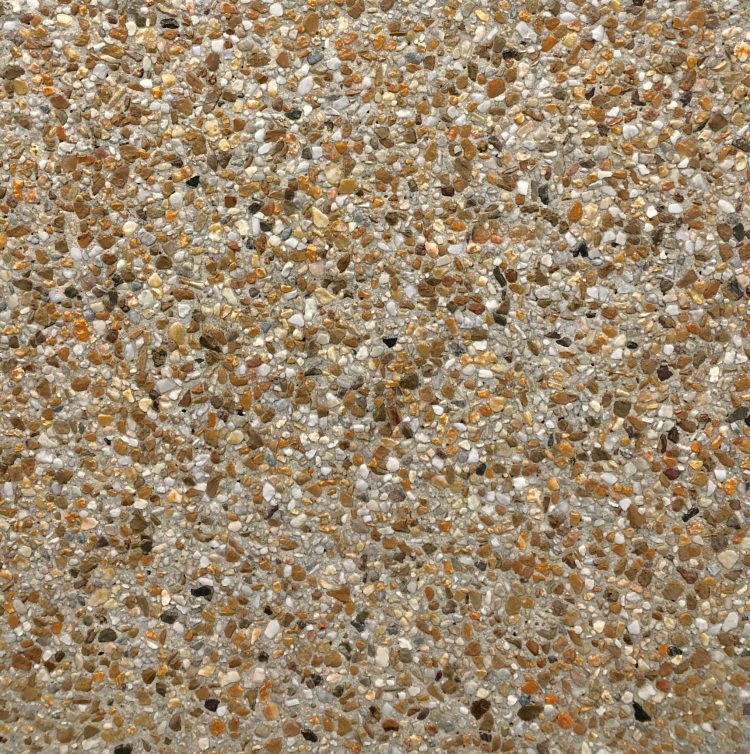 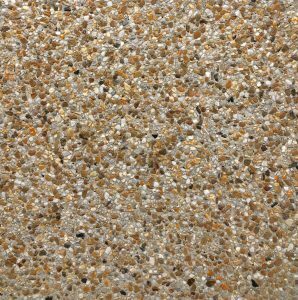 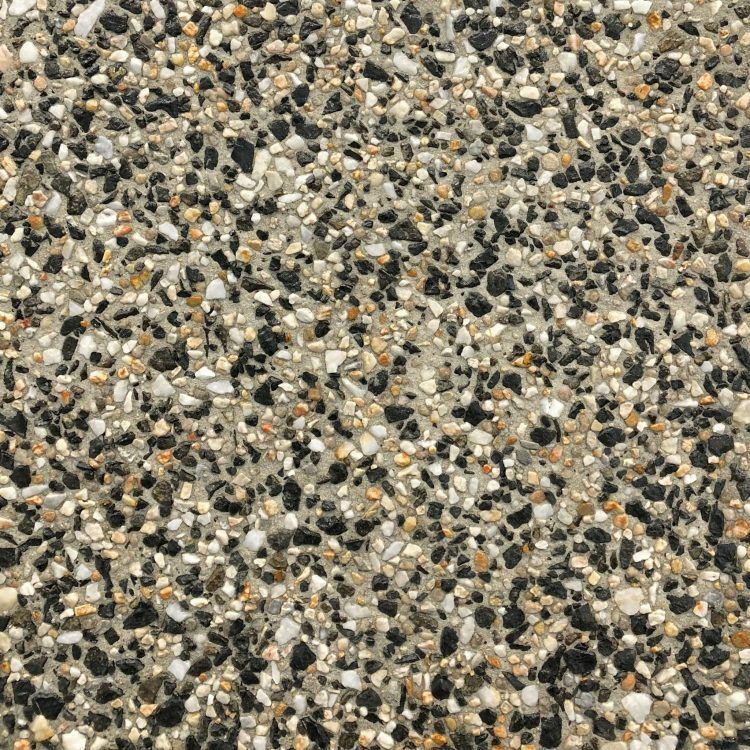 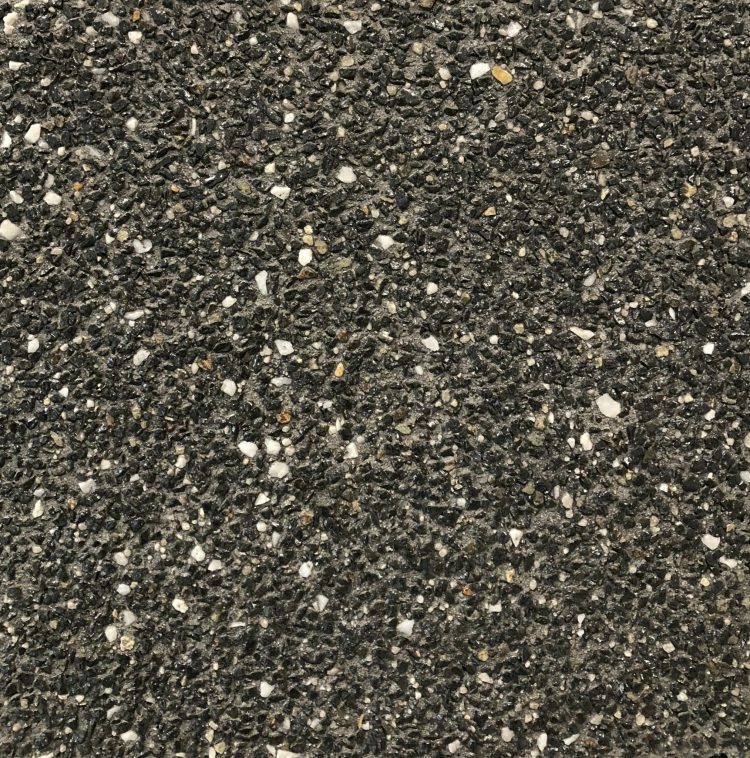 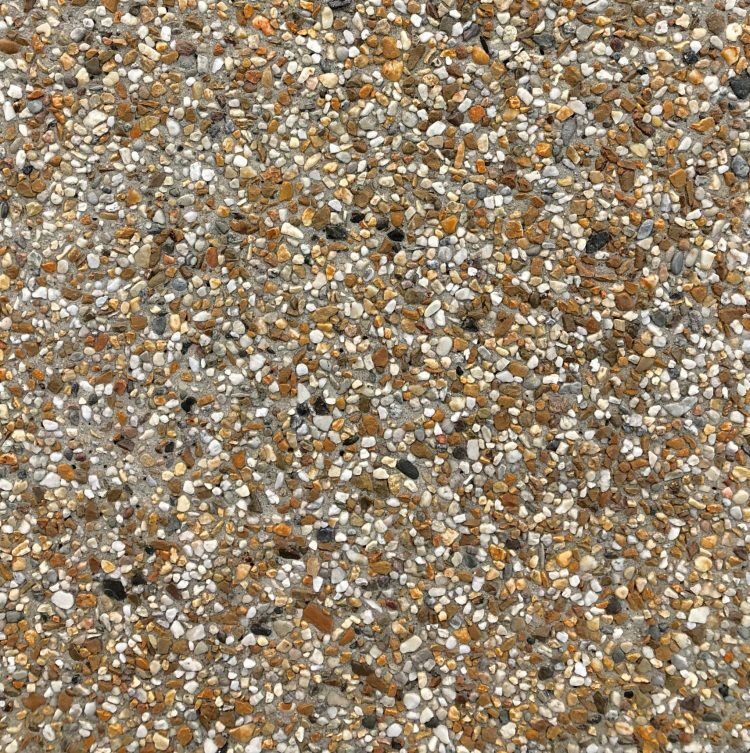 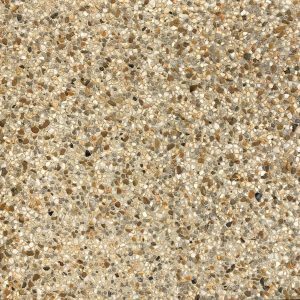 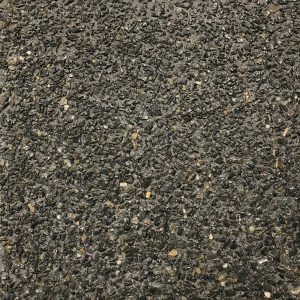 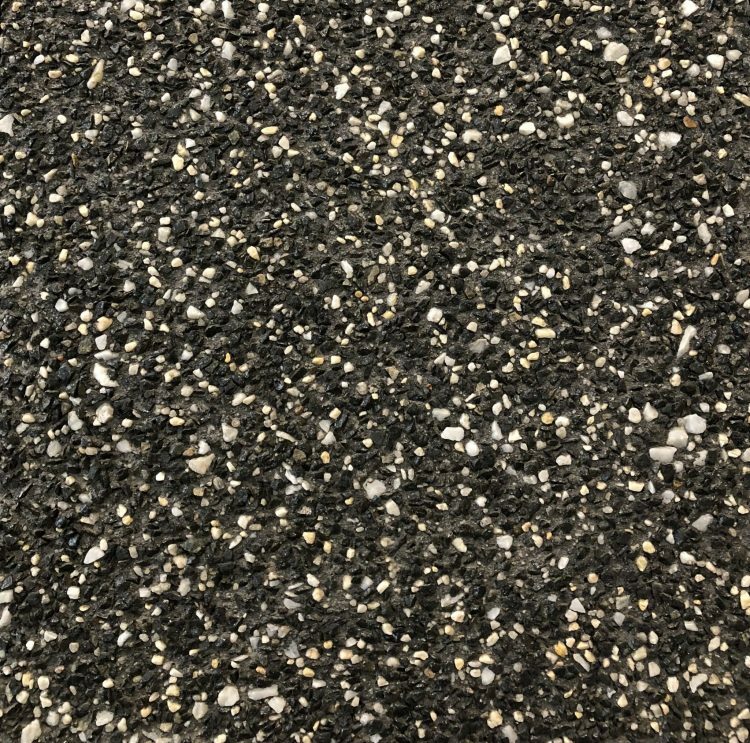 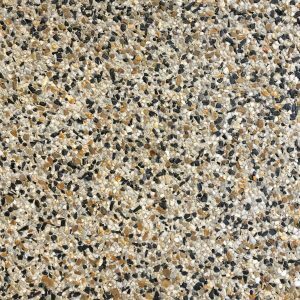 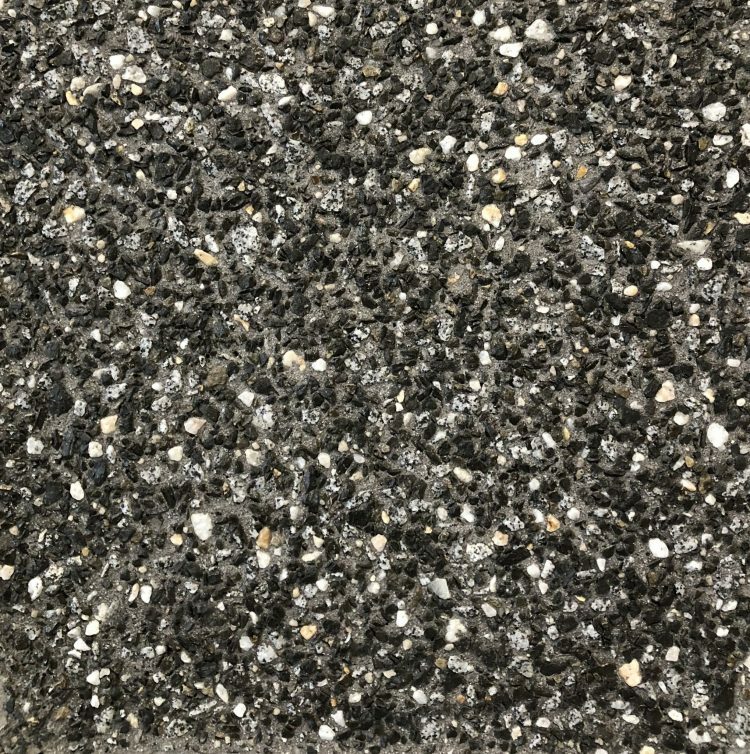 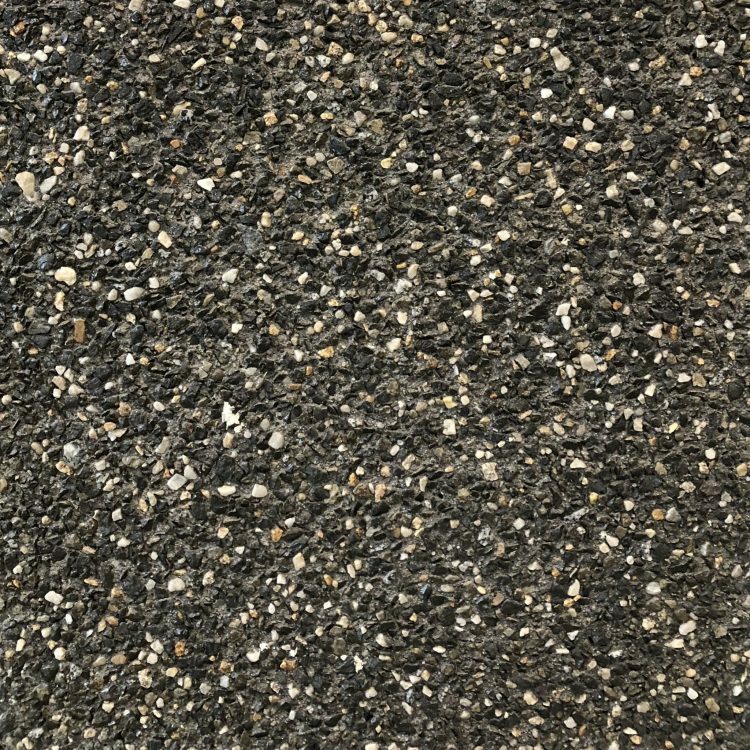 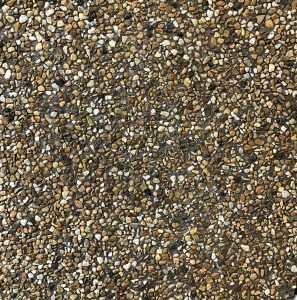 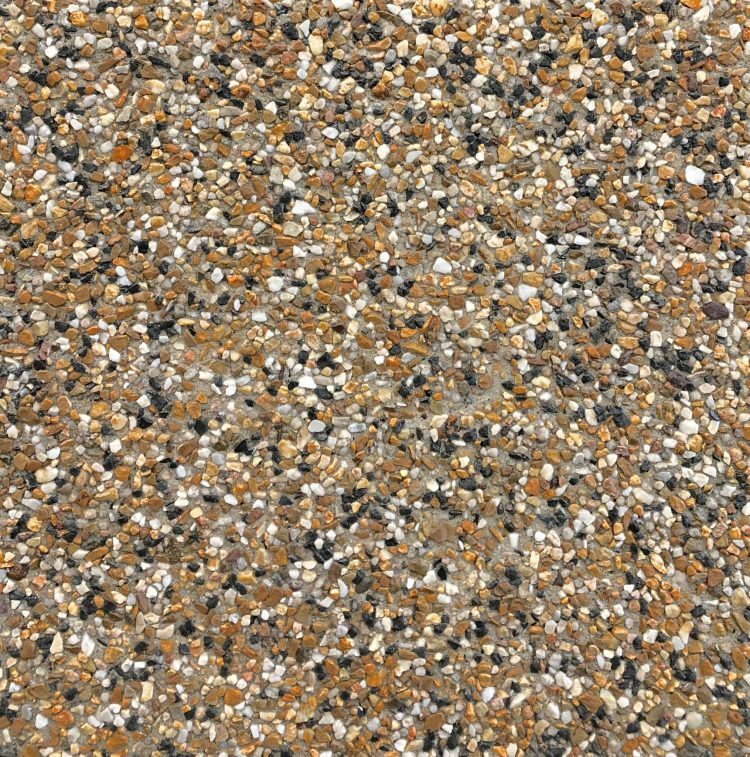 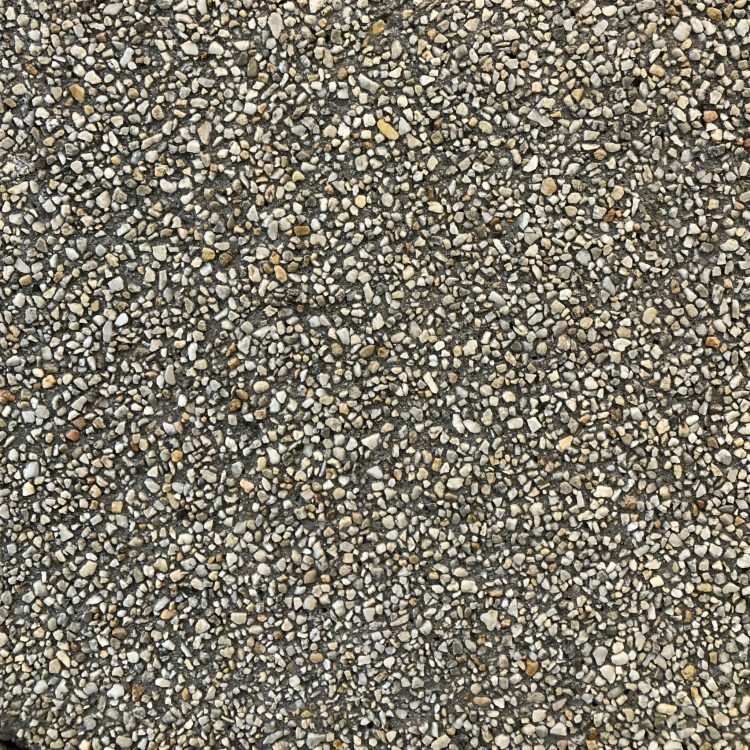 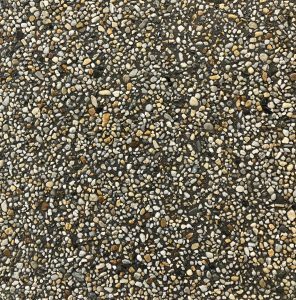 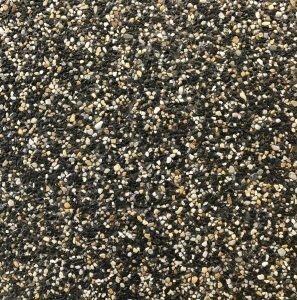 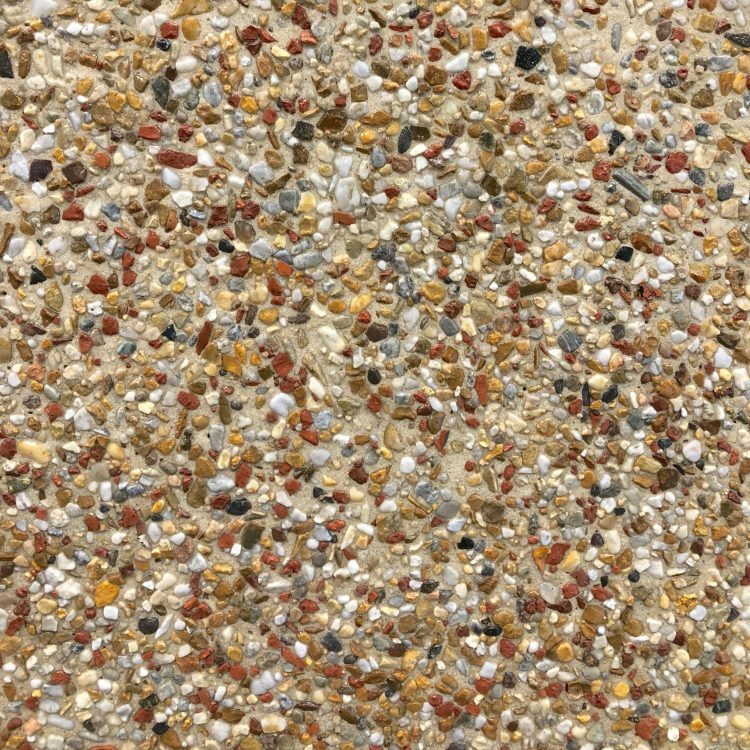 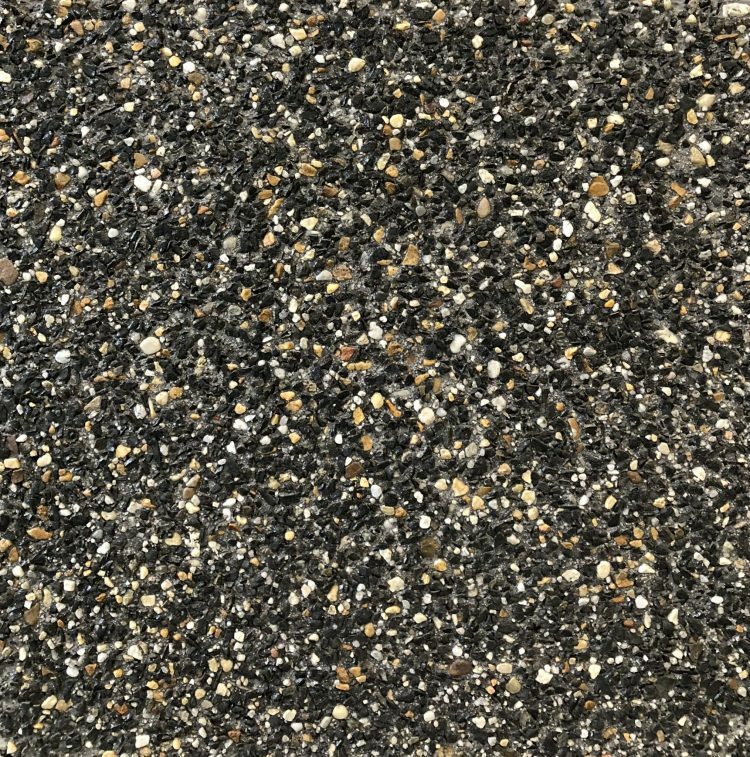 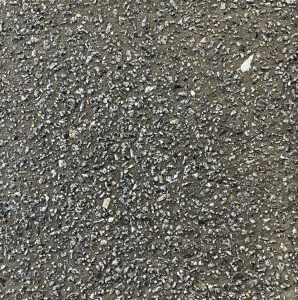 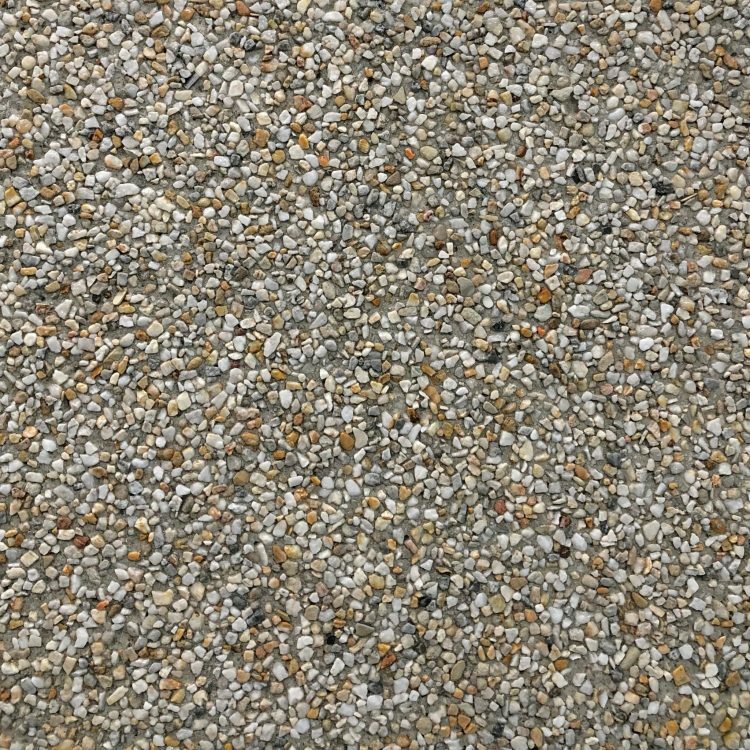 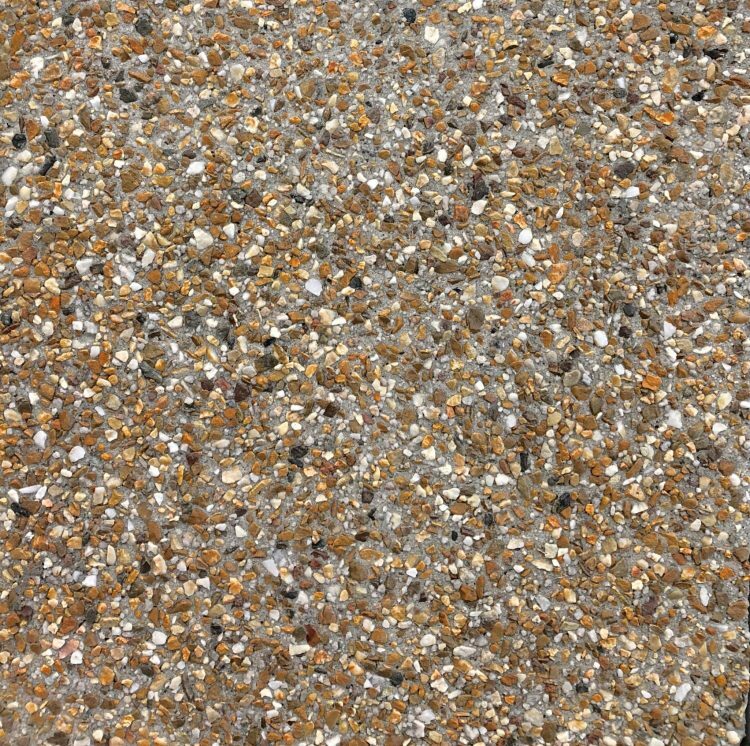 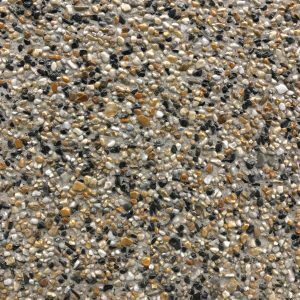 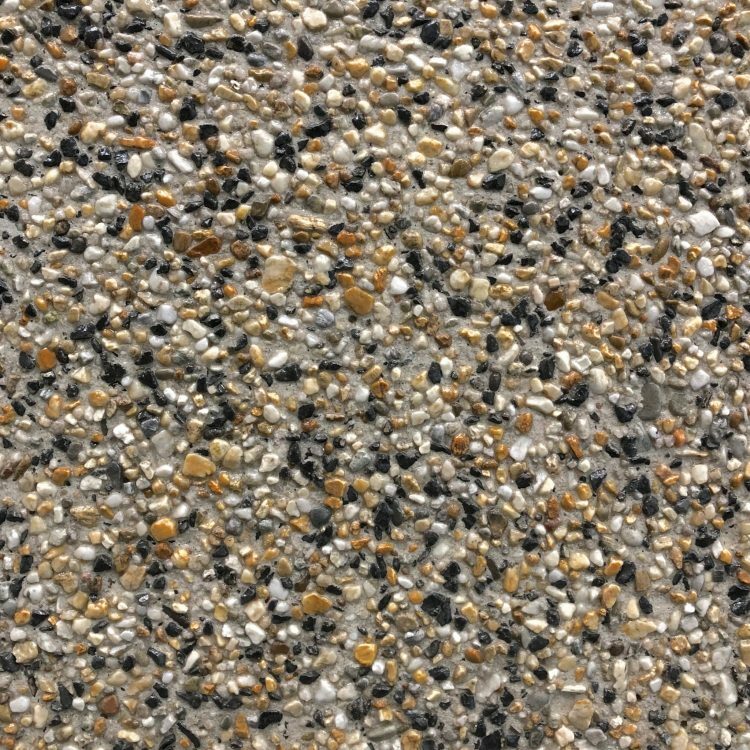 With concrete base choices from, grey and charcoal through to off-white and colour oxides, our range of exposed aggregate mixes is set to leave you speechless. 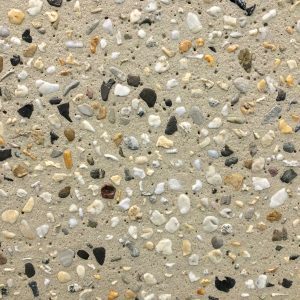 Bring us your design ideas, and our friendly sales team will show you our range we have on display in our Showroom at Clayton South, Melbourne and then sit down with you to work out a unique concrete solution perfect for your project. 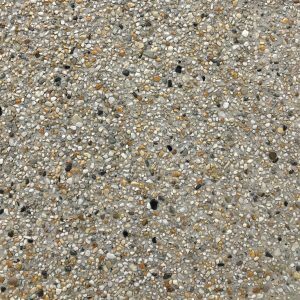 So, for the very best in exposed aggregate concrete Melbourne call Metro Mix Concrete today on 1300 Metro Mix. 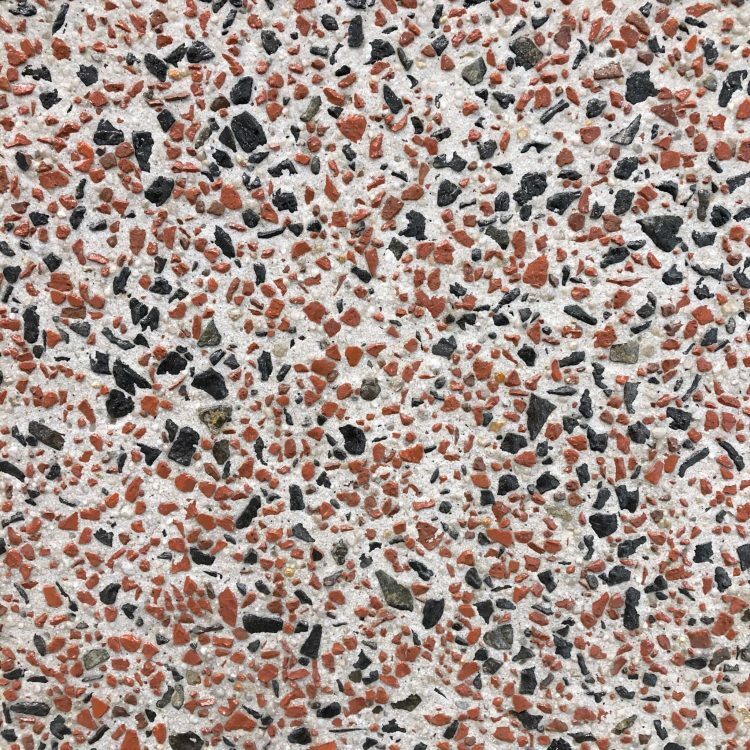 There’s no mix like METRO MIX. 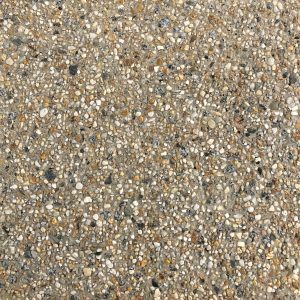 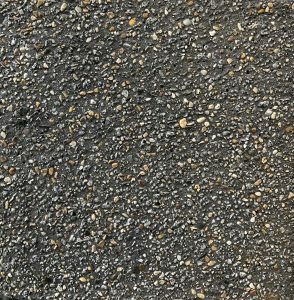 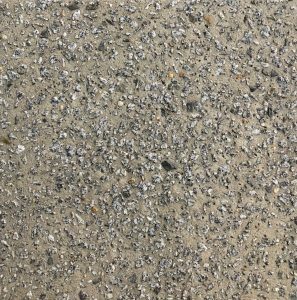 Exposed Aggregate concrete is placed (min thickness usually 100mm, for driveways). 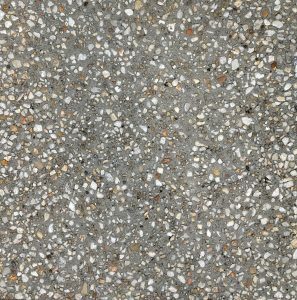 Once the exposed aggregate is on the ground the concreter screeds the concrete, forming the area’s levels and run offs. 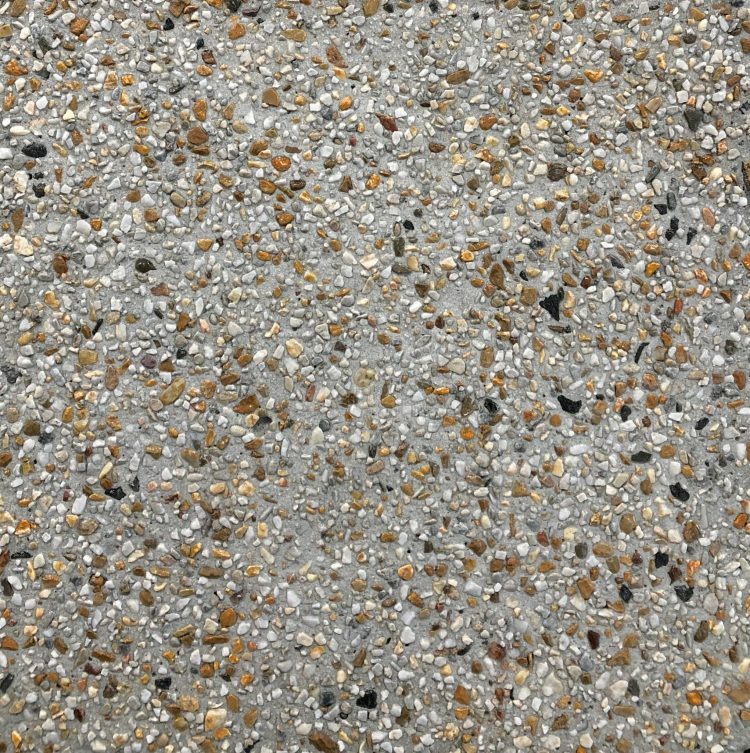 A bull float is then used to smooth out all screed lines and flatten the surface. 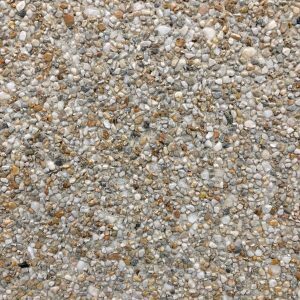 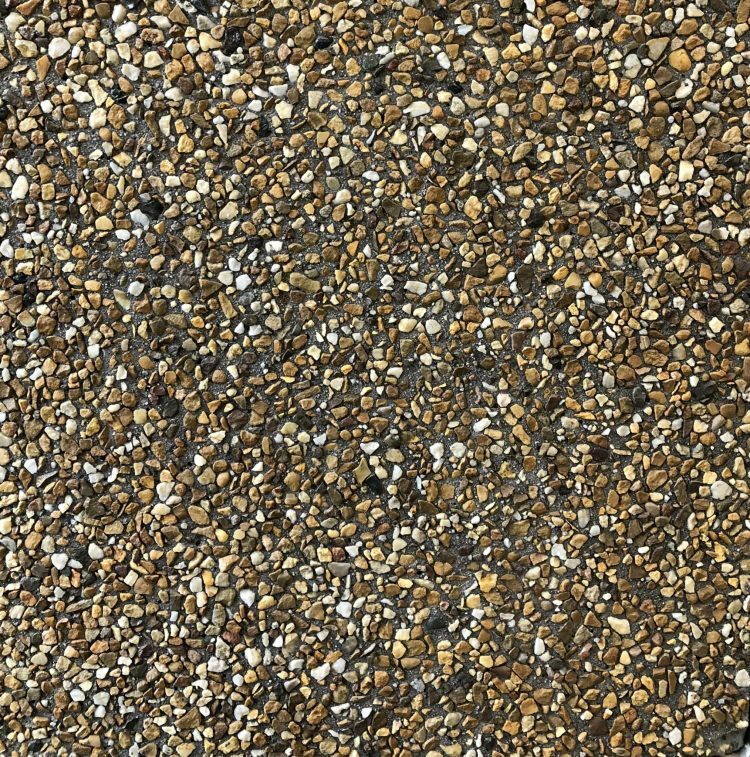 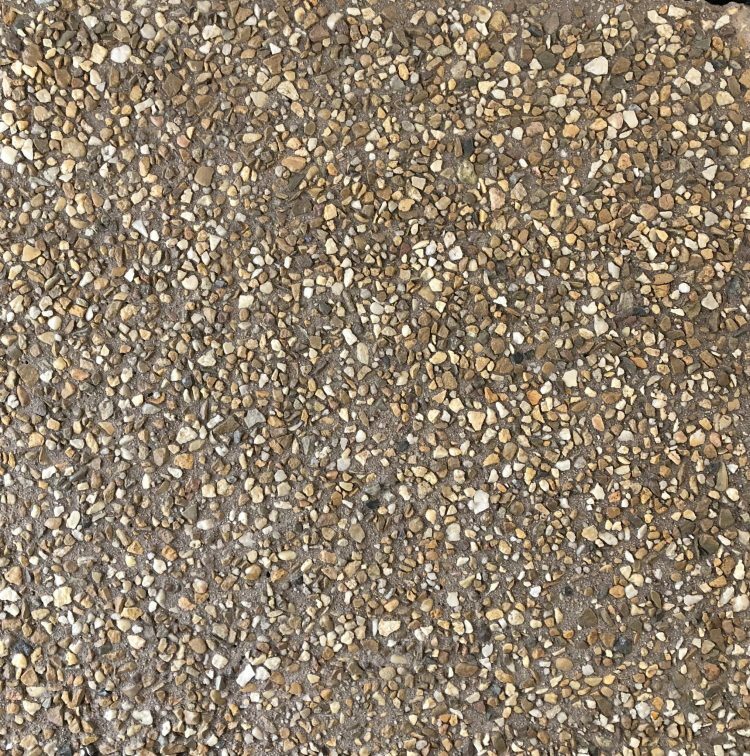 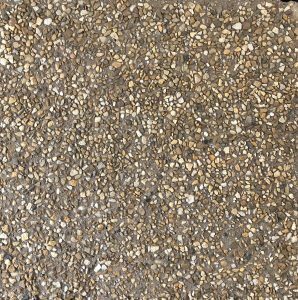 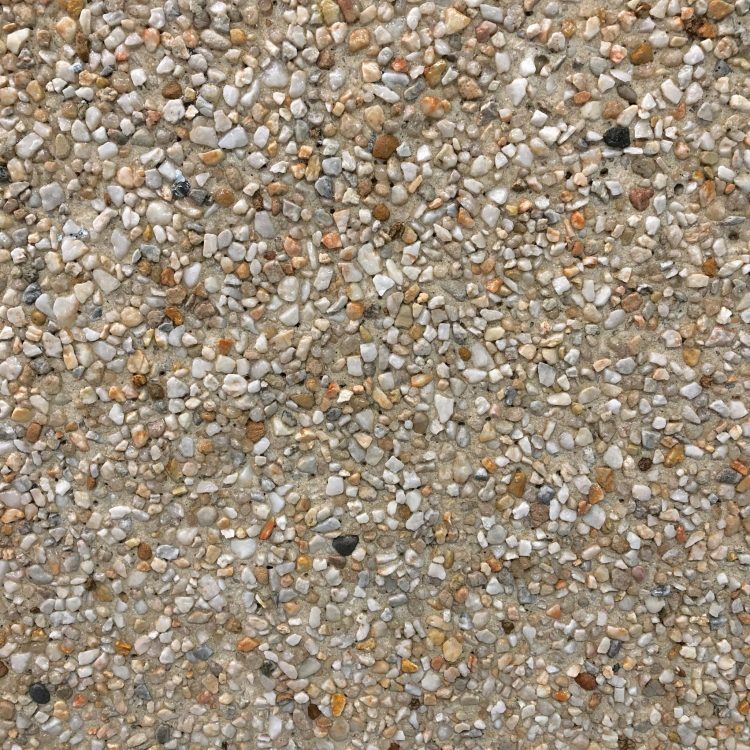 As the exposed aggregate mix begins to set, they will edge all necessary areas and hand or stick trowel the entire surface to once again smooth out all imperfections, this also helps to flatten out all aggregate below giving it a very even and consistent look once washed off. 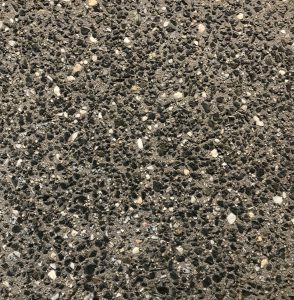 Once the exposed aggregate has been finished and the bleed water has begun to dry up, they will spray on a surface retarder which is designed to keep the very top layer of the concrete moist. 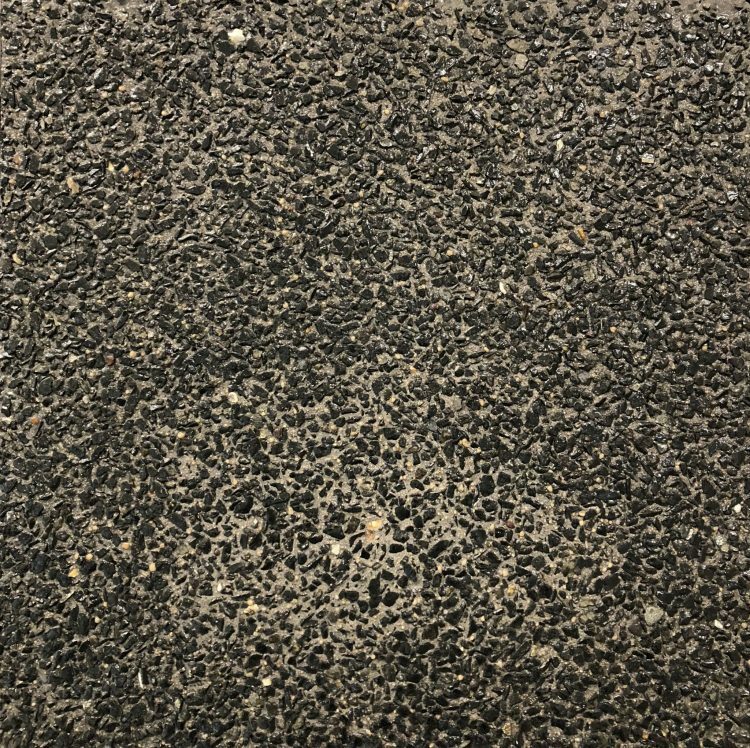 These retarders are coloured to enable the concreter to see where it has been applied. 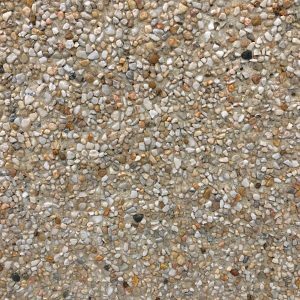 In some applications, including hotter days and the wetter months they may cover the exposed aggregate with polythene to protect it from the elements. 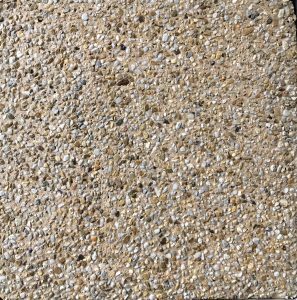 If too much slurry is washed away this is known as over exposure which can make the mix look different as majority of the slurry is removed from in between the aggregates. 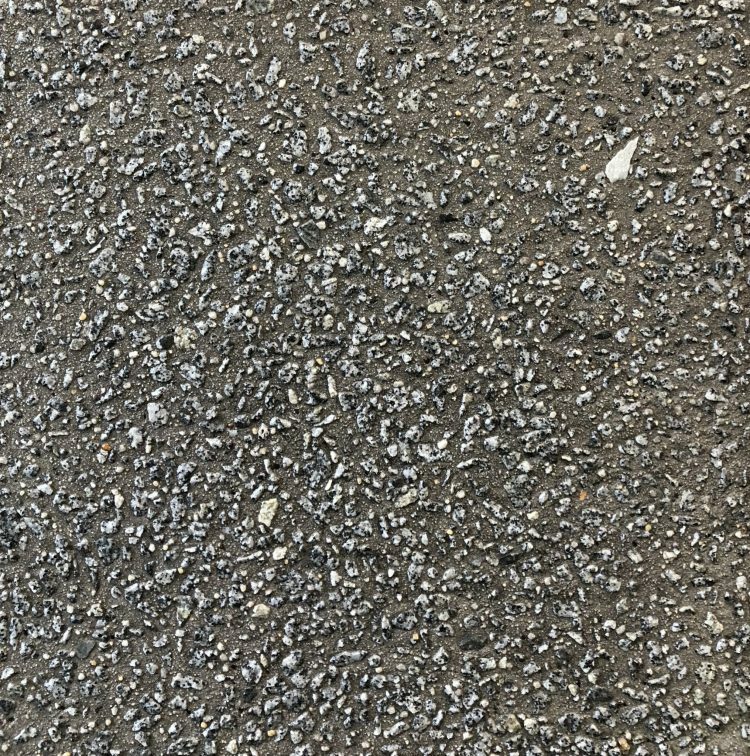 On the other hand, if not enough of the slurry is washed off this is known as under exposure which can also make the mix look different as there will be more slurry which will give it the appearance that there is less aggregate, but really the aggregate is still there but just deeper under the surface. 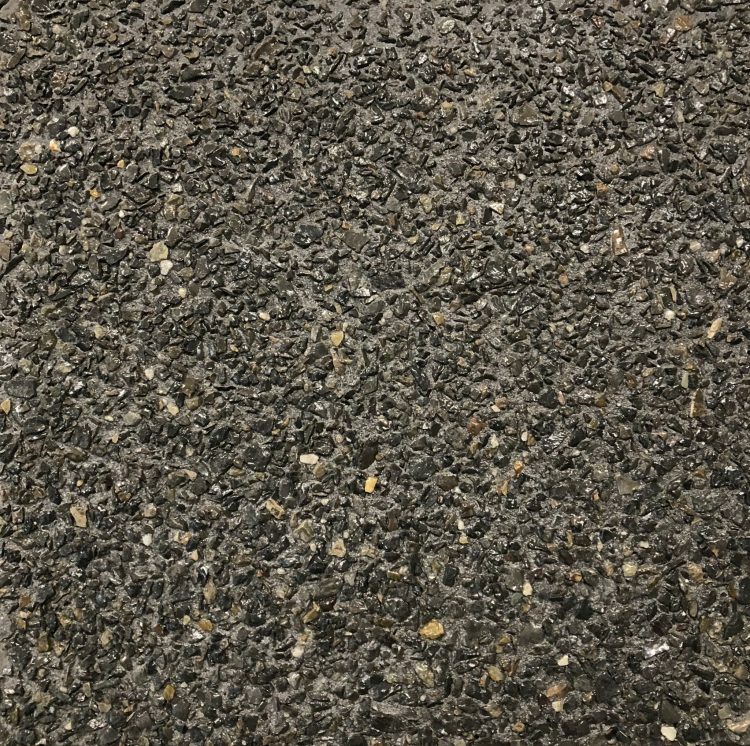 Once exposed the concreter will then acid wash the surface (sometimes same day or next day) using a mix of hydrochloric acid and water, this helps clean all residue including excess slurry and other contaminants, this process can also be used to even out inconsistencies in the exposure. 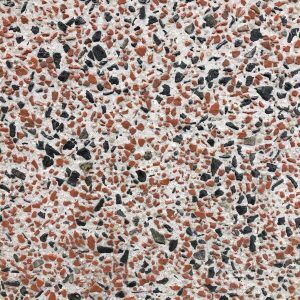 If the area is big enough the concreter will saw cut, expansion cuts to help minimise and control cracking. 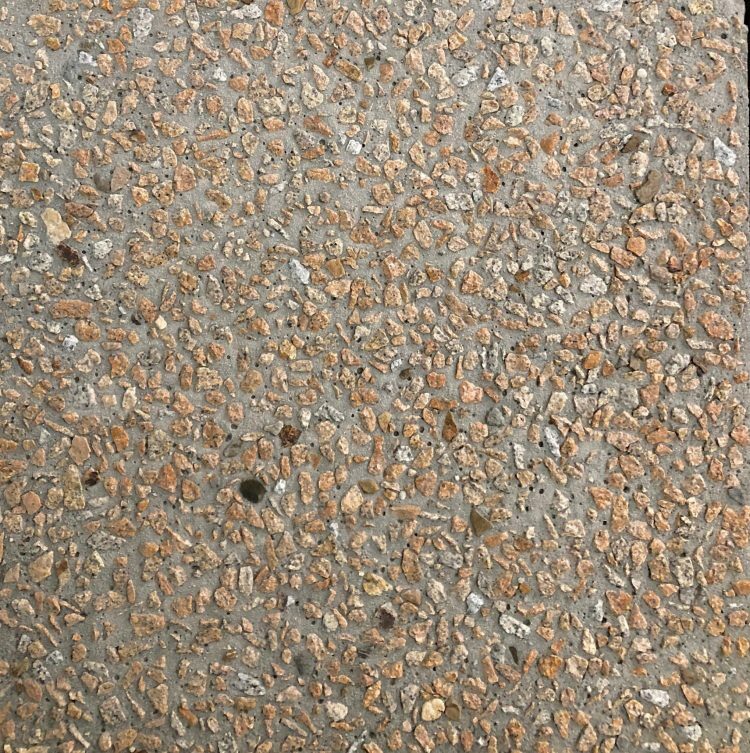 They will wash area after cutting (they may acid wash after saw cuts). 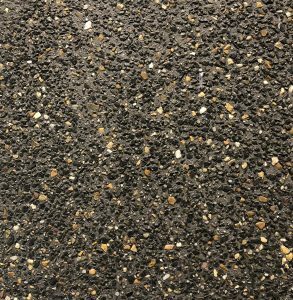 Once the concrete surface has dried out to a suitable level, the concreter will apply a surface sealer (usually 2 coats) this not only protects the concrete but increases colour and enhancement of the exposed aggregate. 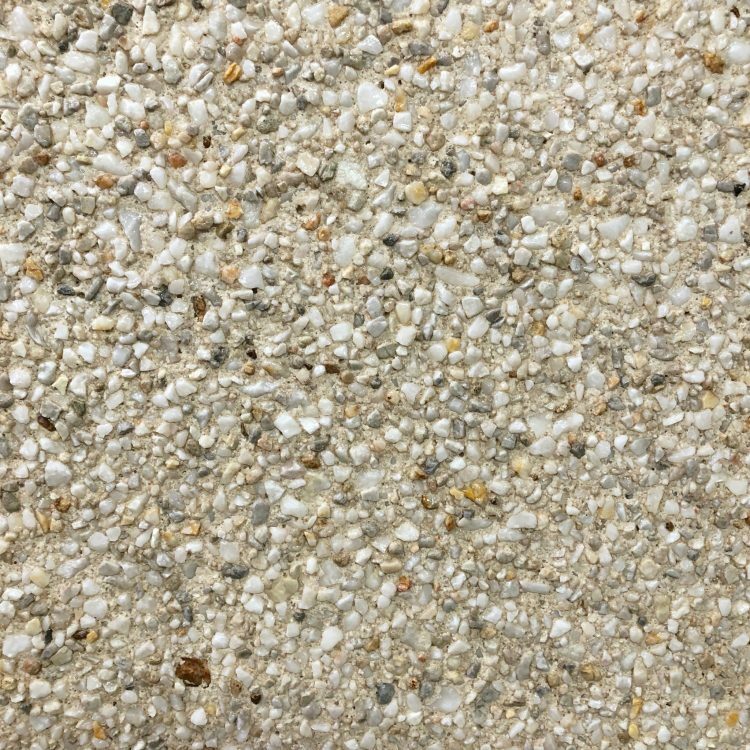 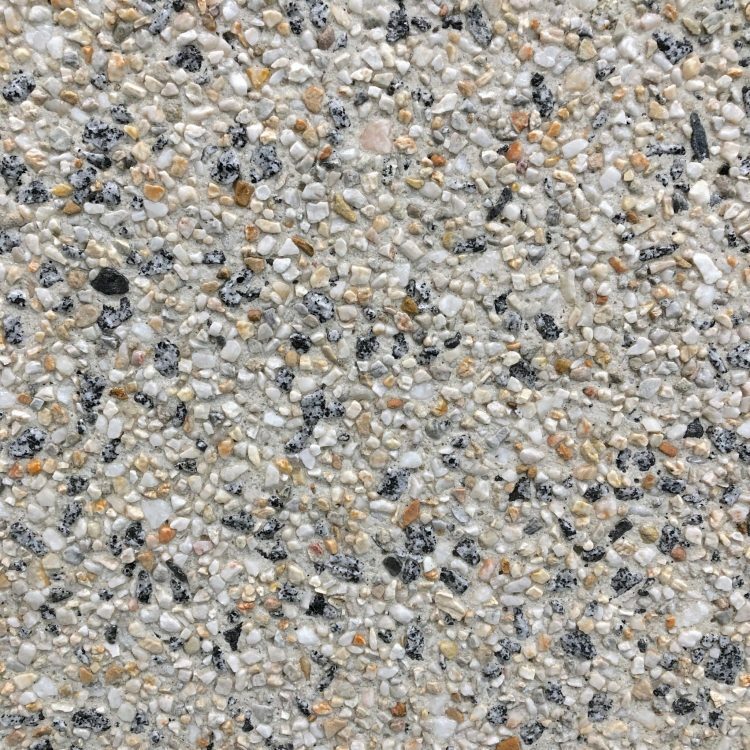 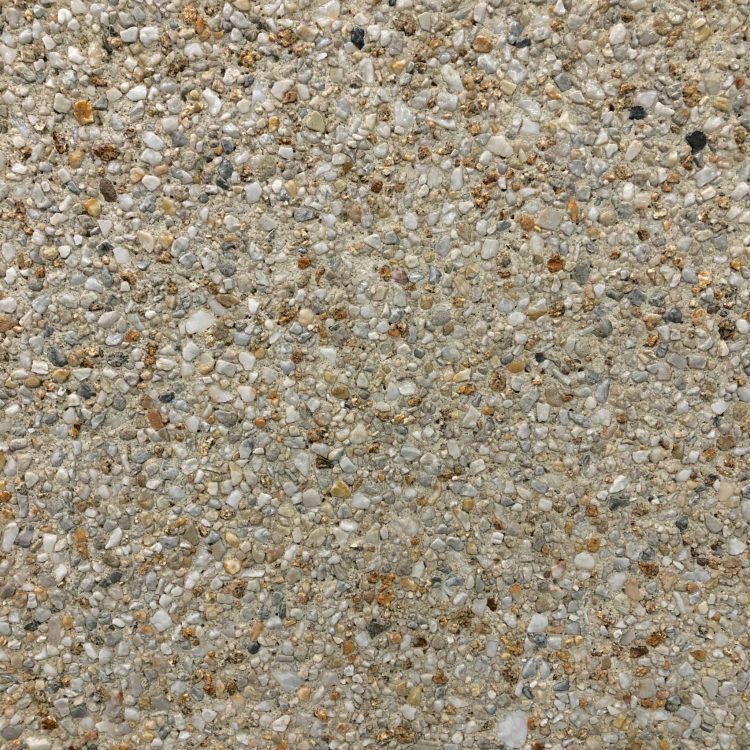 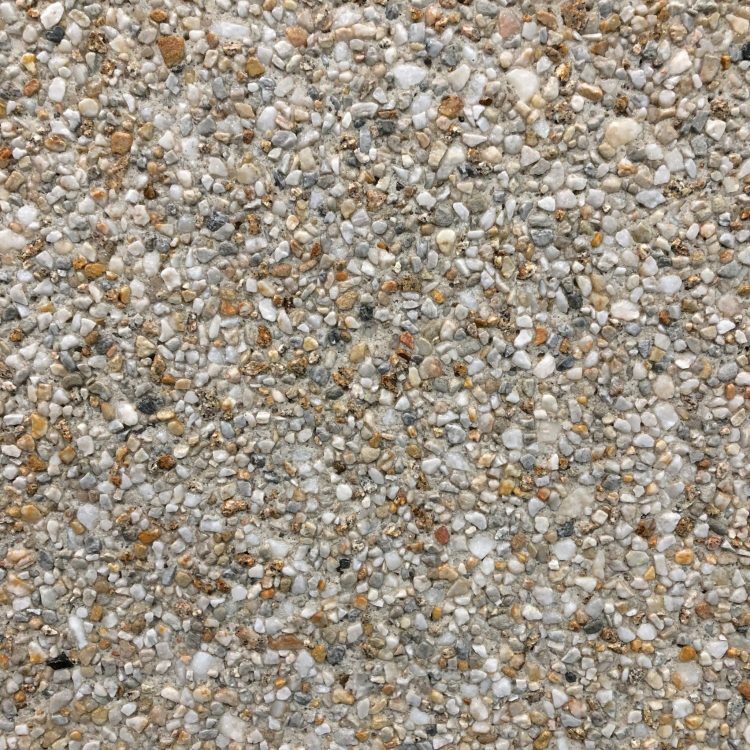 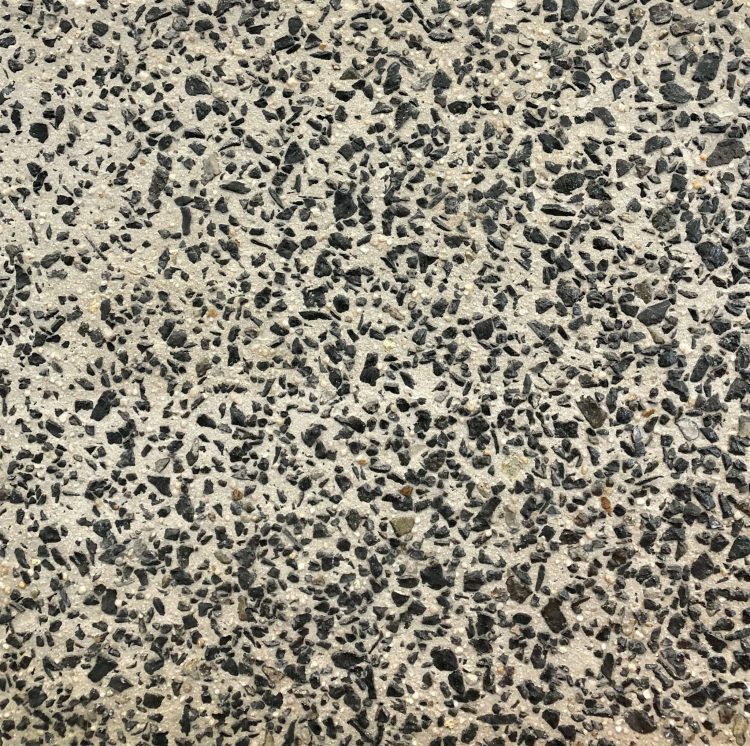 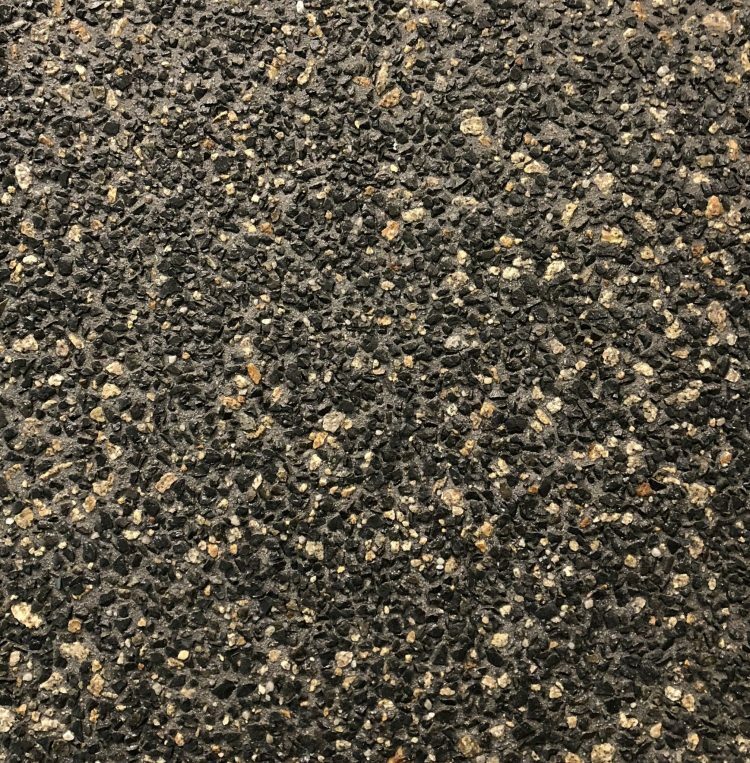 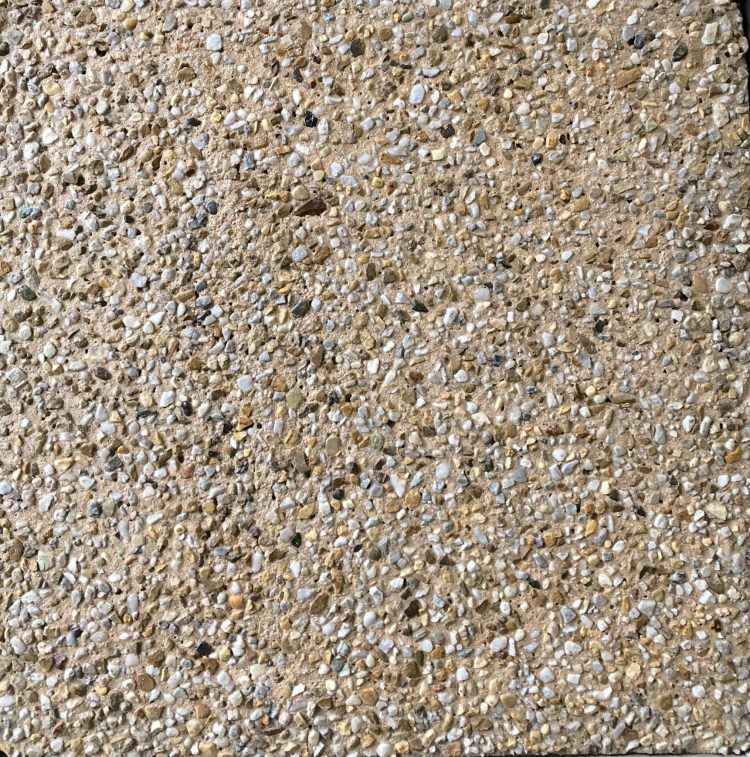 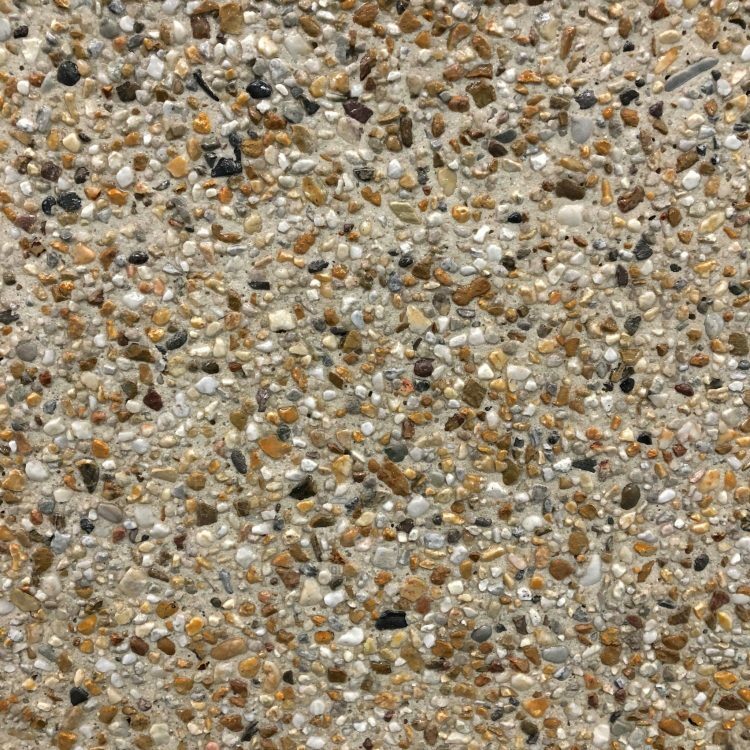 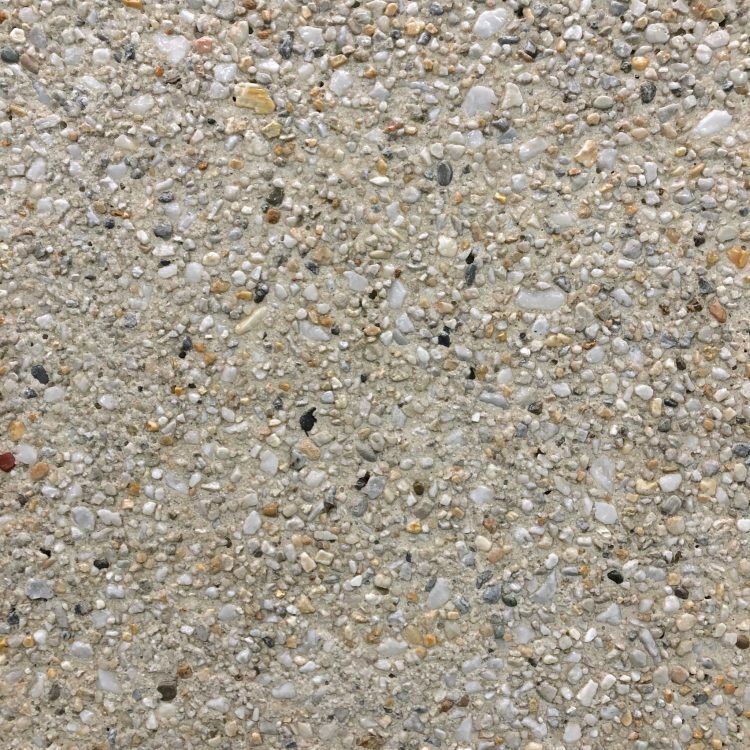 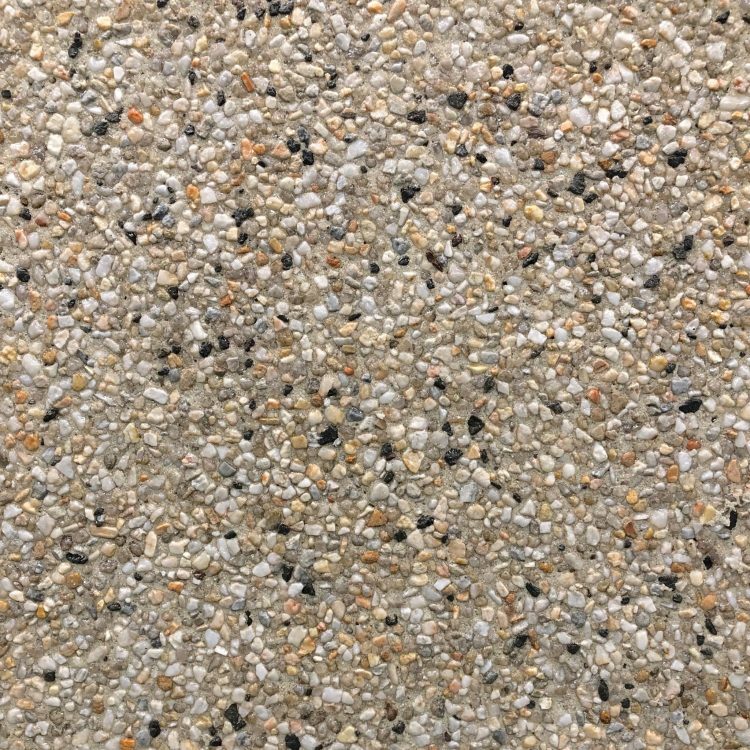 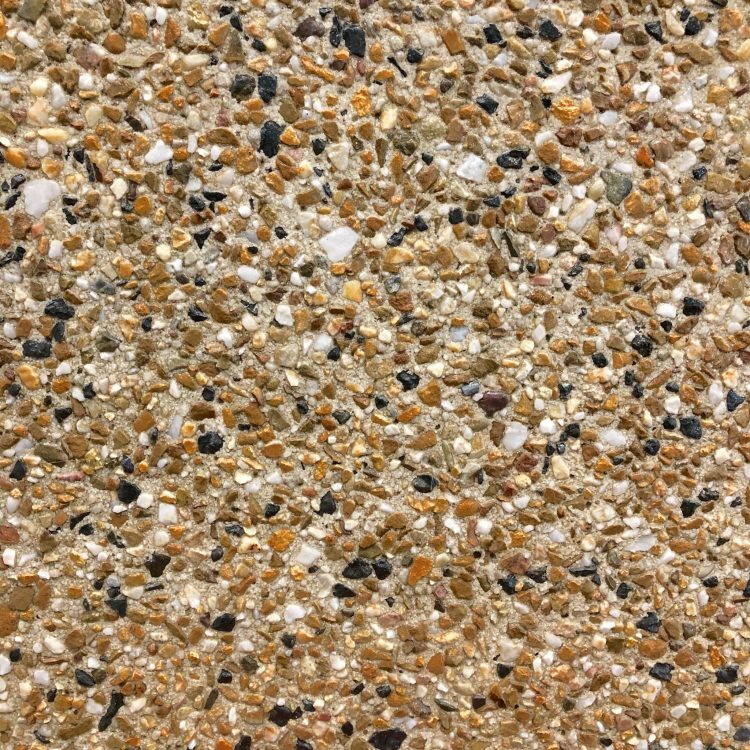 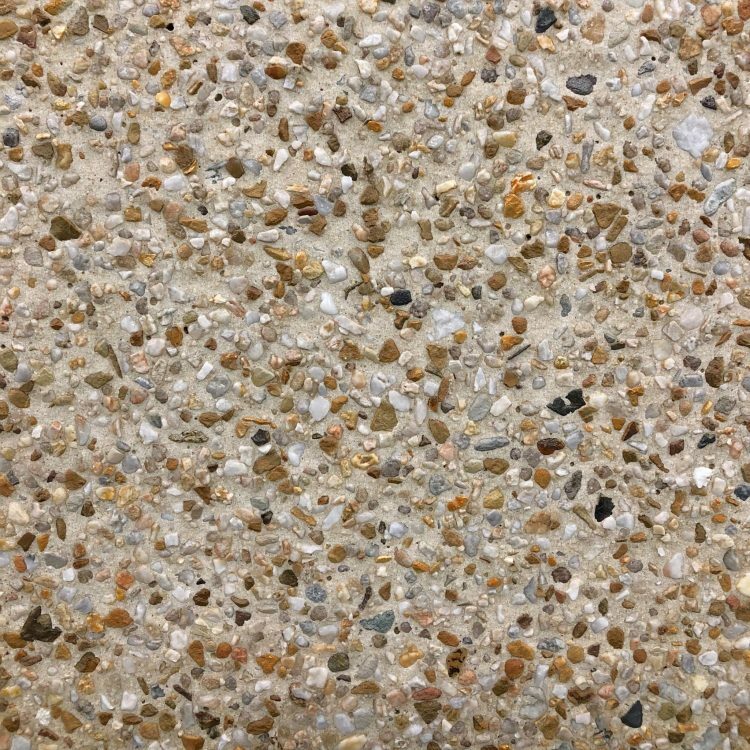 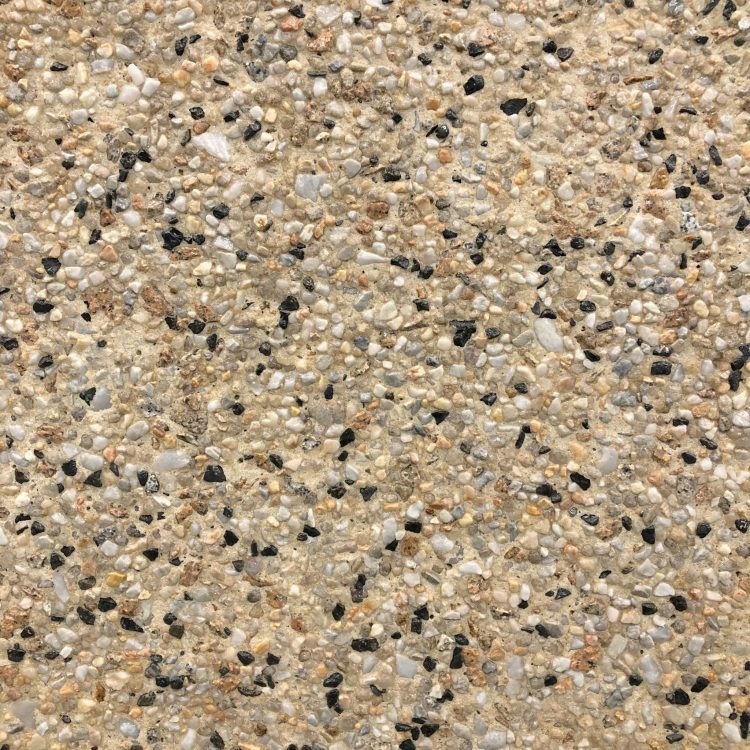 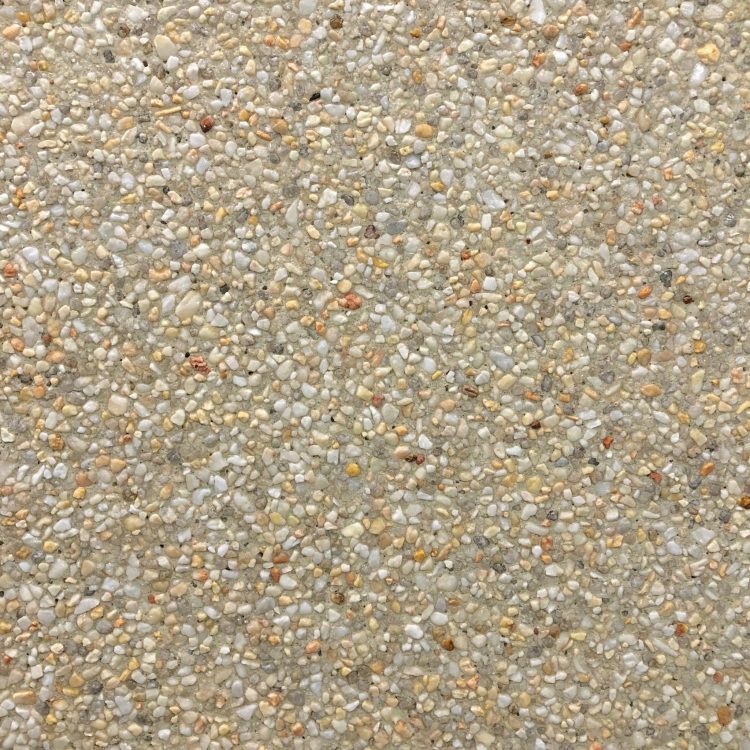 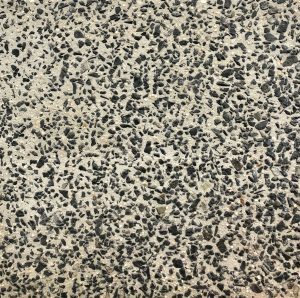 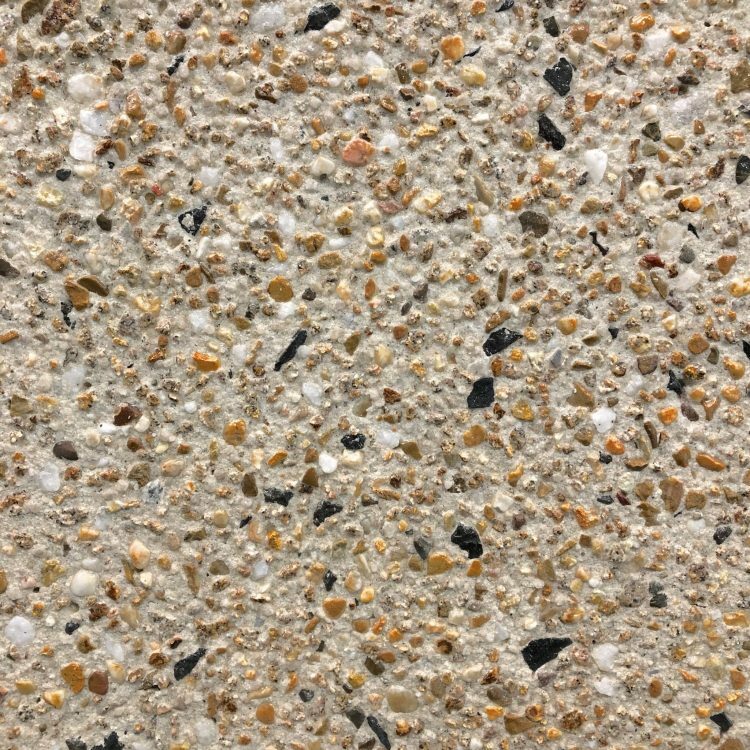 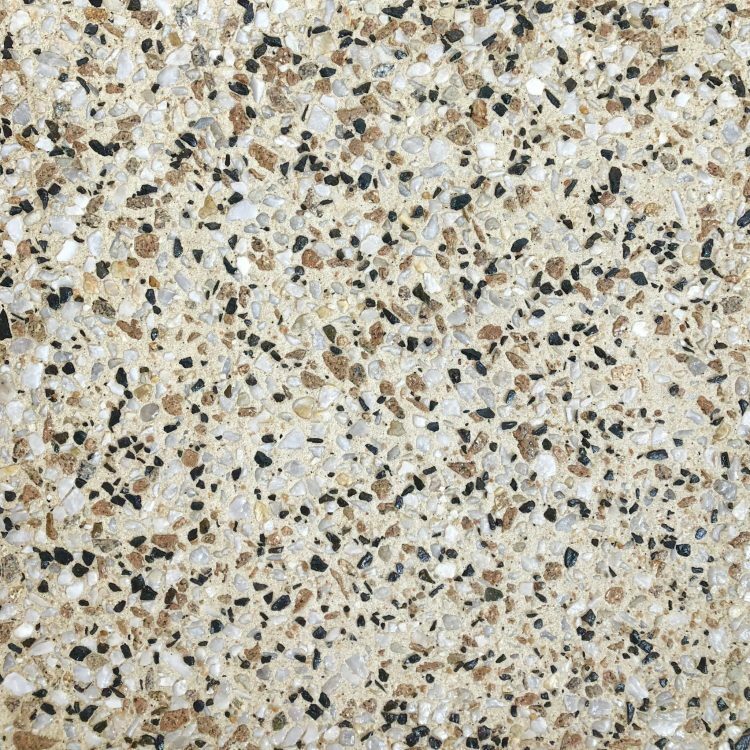 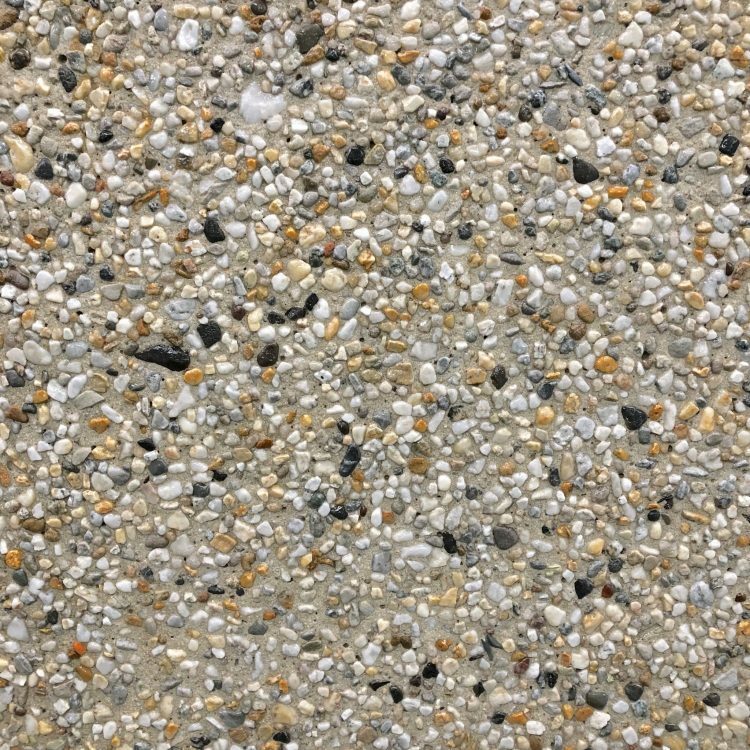 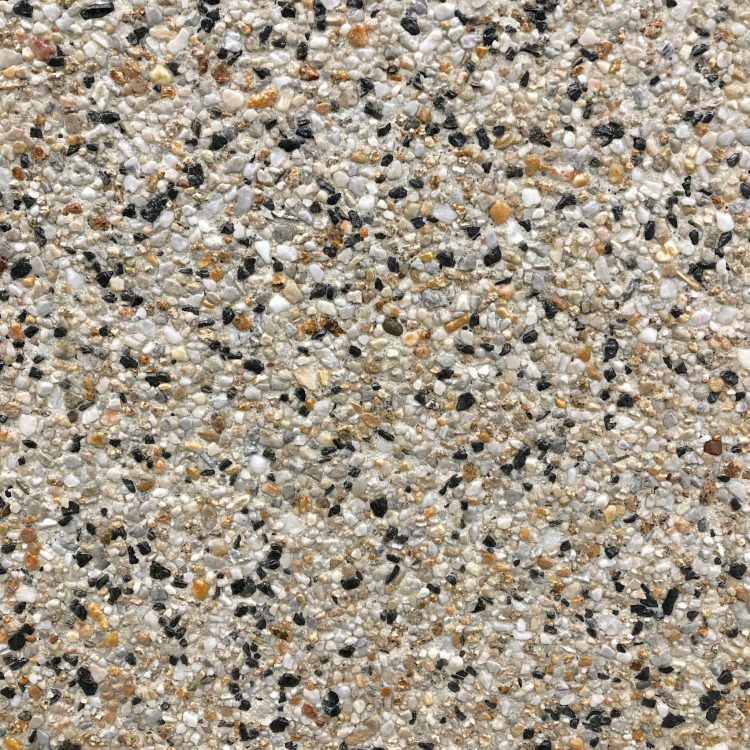 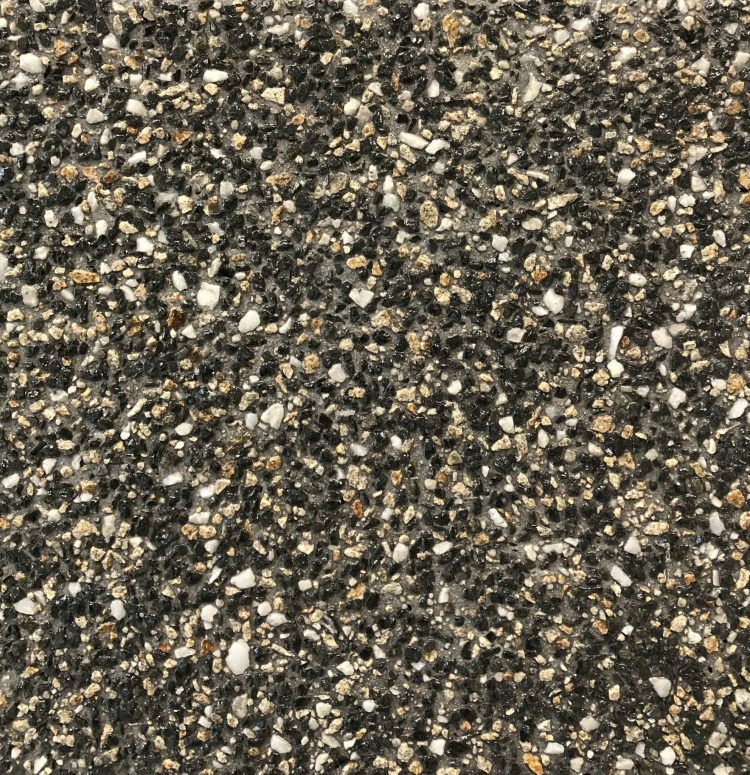 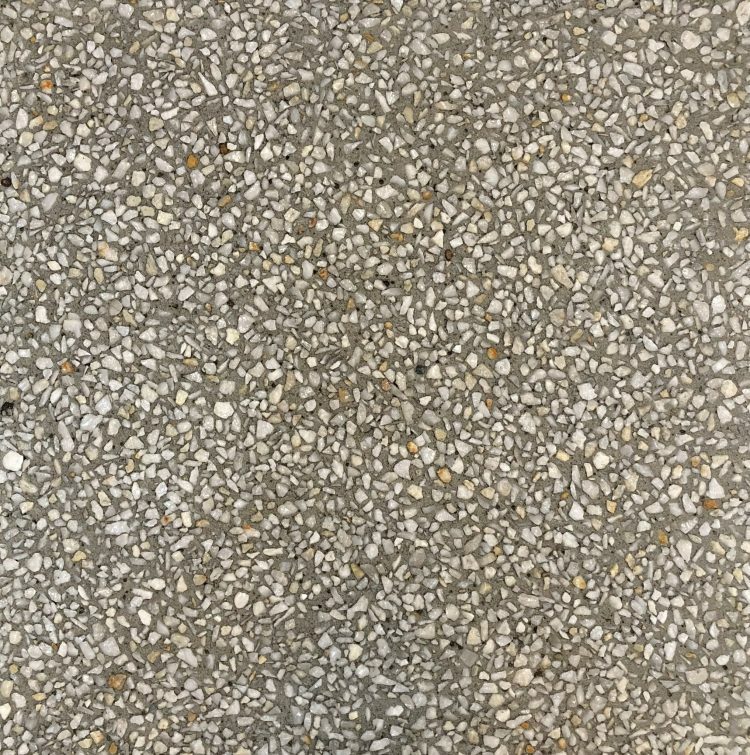 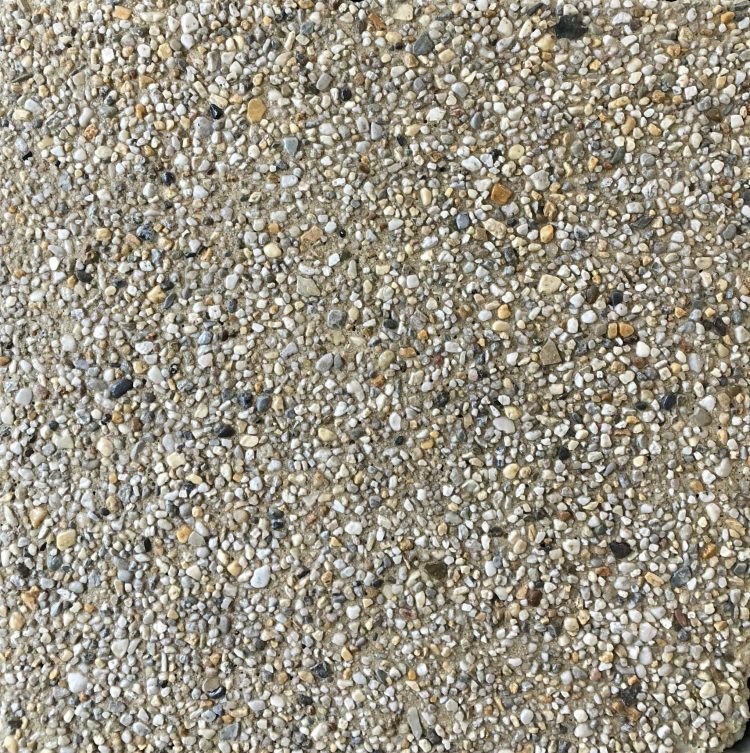 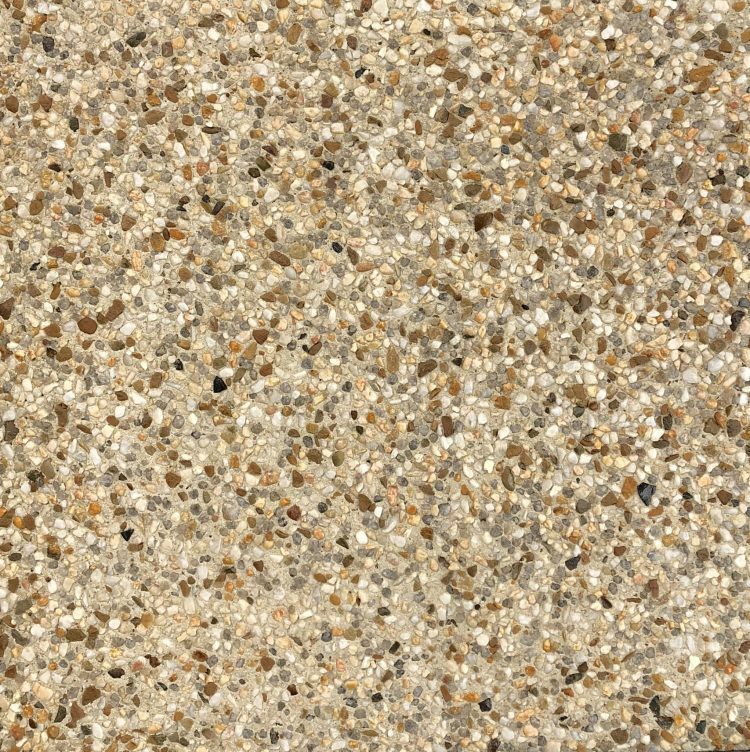 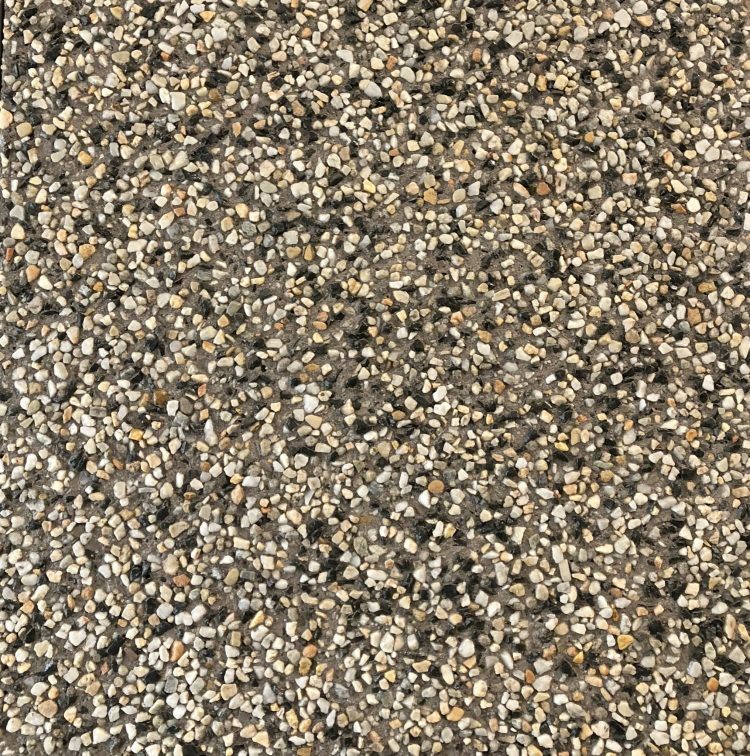 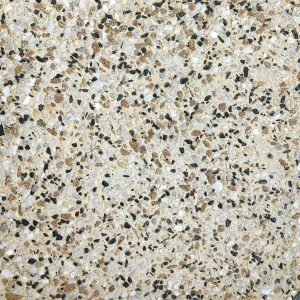 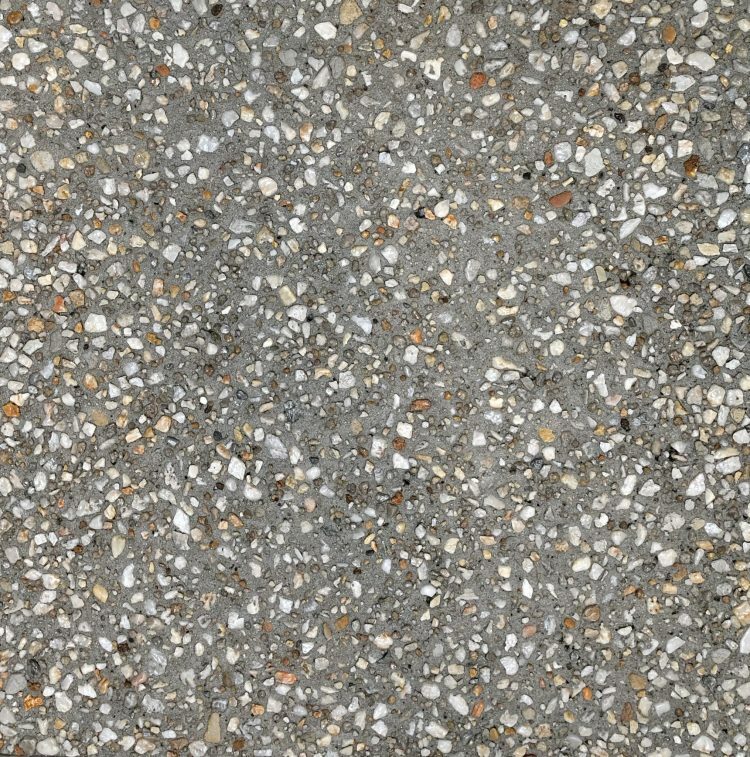 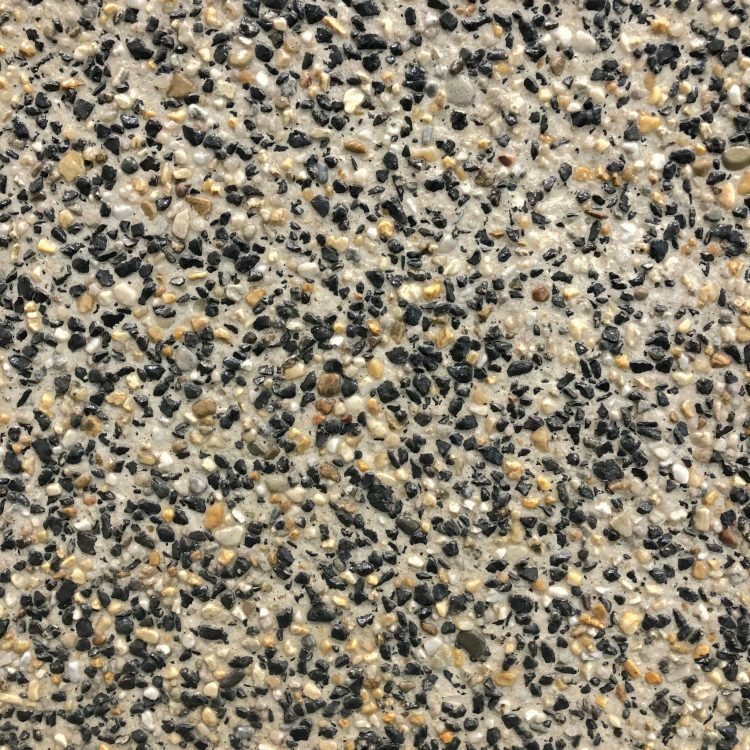 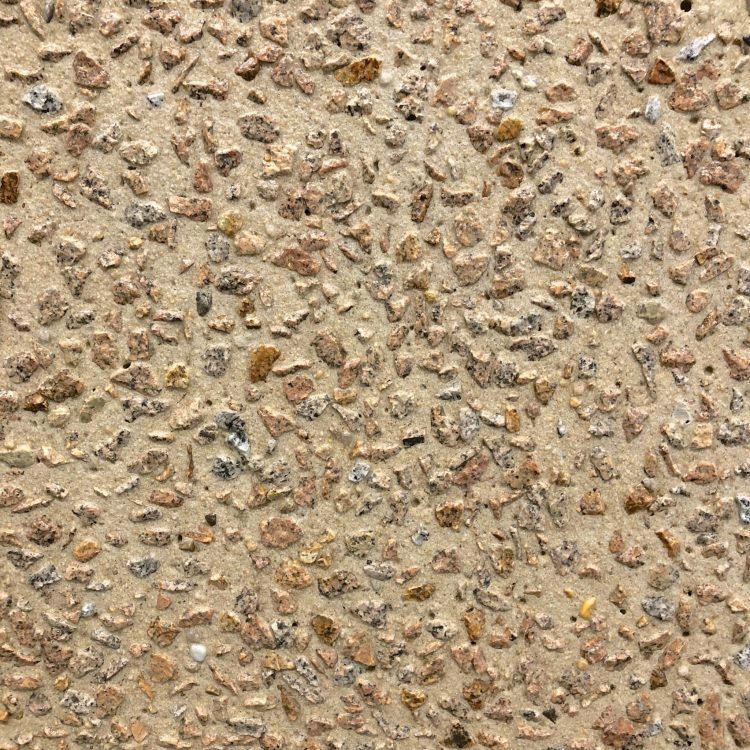 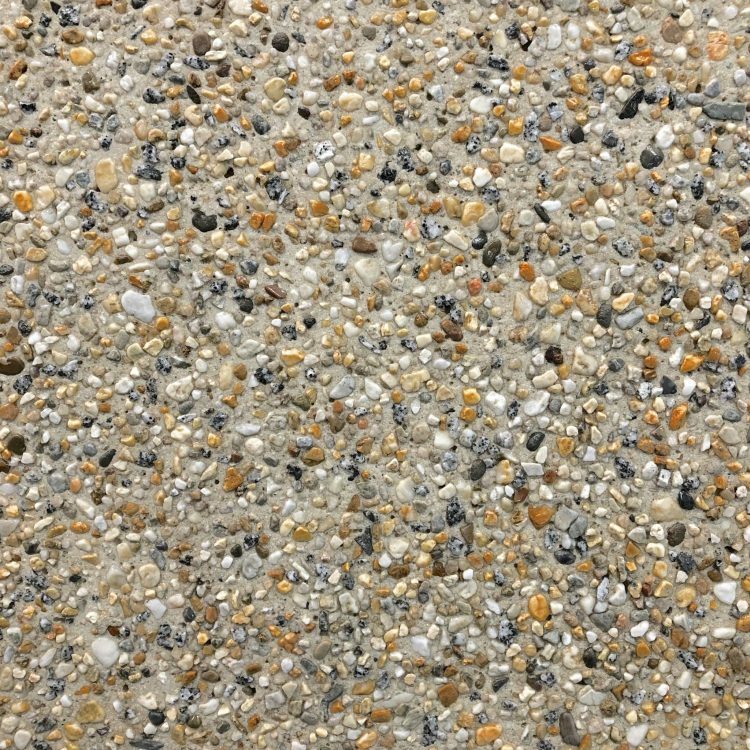 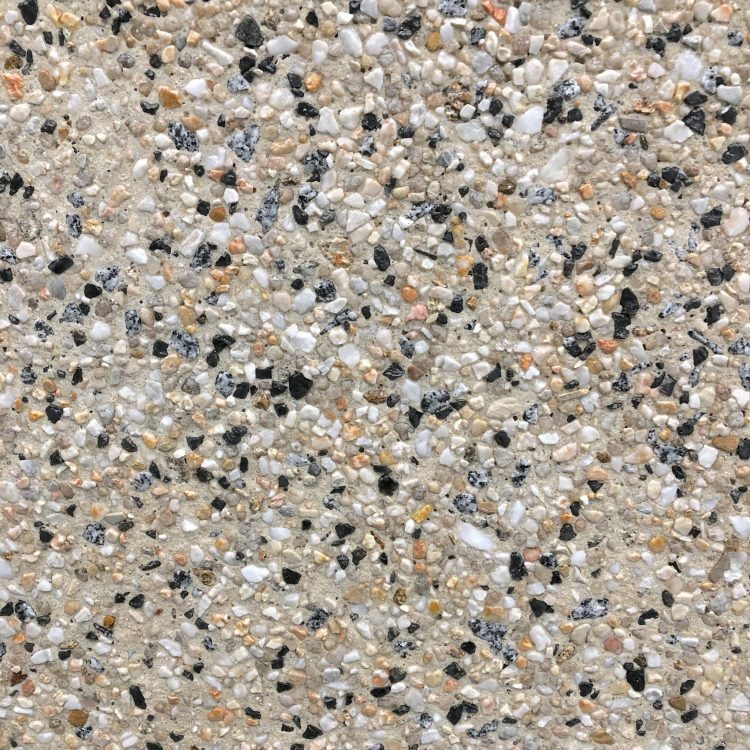 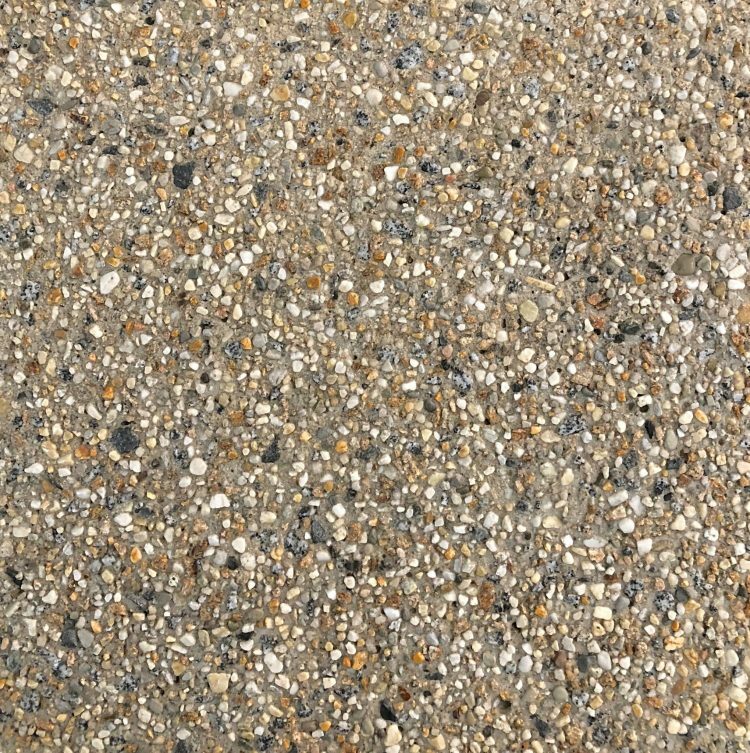 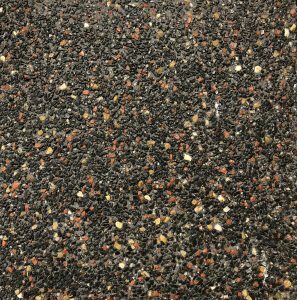 Please remember that exposed aggregate concrete like normal concrete is made from natural resources and laid by man not machine, there are many elements and variables that can affect the final finish. 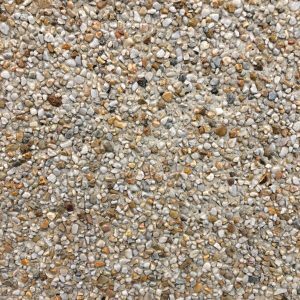 We suggest using a recommended exposed aggregate contractor.